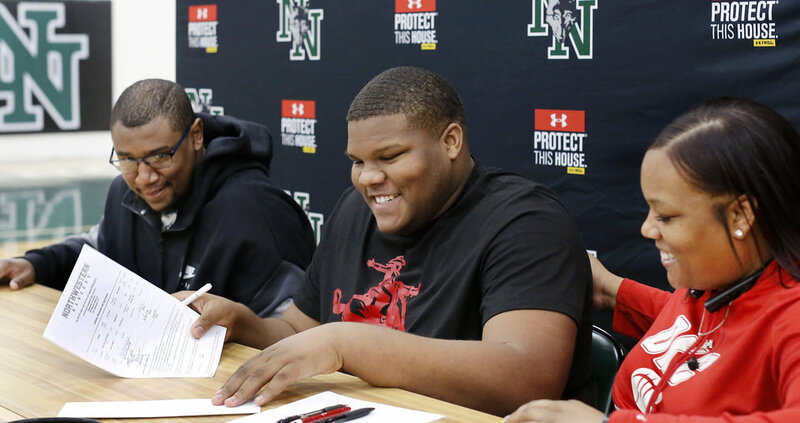 Know of a player who signed a letter of intent but isn&#39;t on this list? 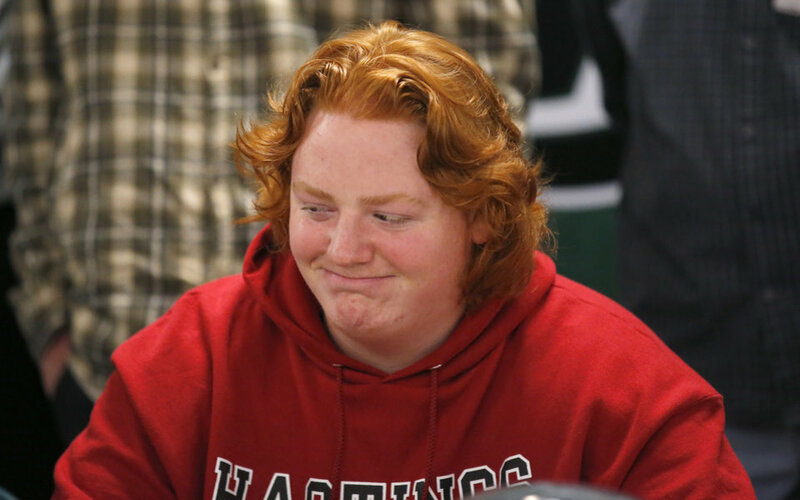 Email the athlete&#39;s name, sport, high school and college to Jacob Unruh at junruh@oklahoman.com. 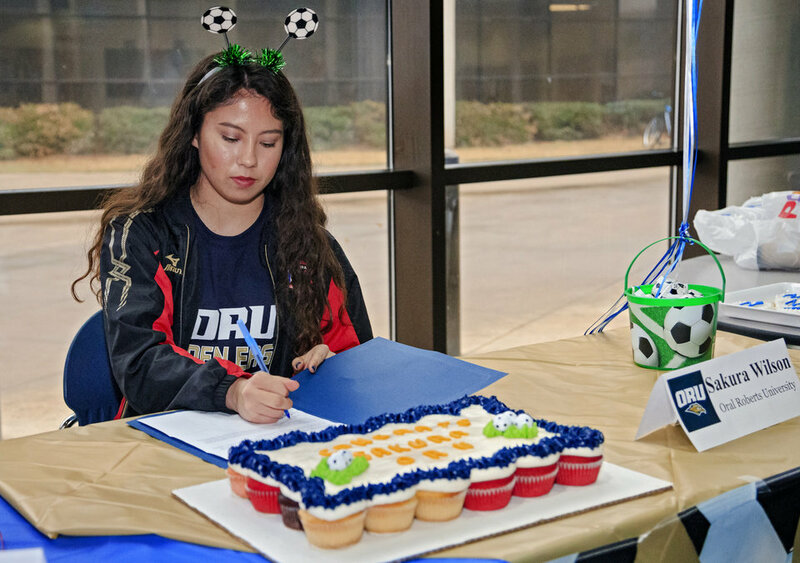 Titan senior Ariana Hernandez comes to the table to sign a letter to play soccer with Oklahoma Baptist University in Shawnee during the Signing Day ceremony at Carl Albert High School on Wednesday, Feb. 6, 2019. 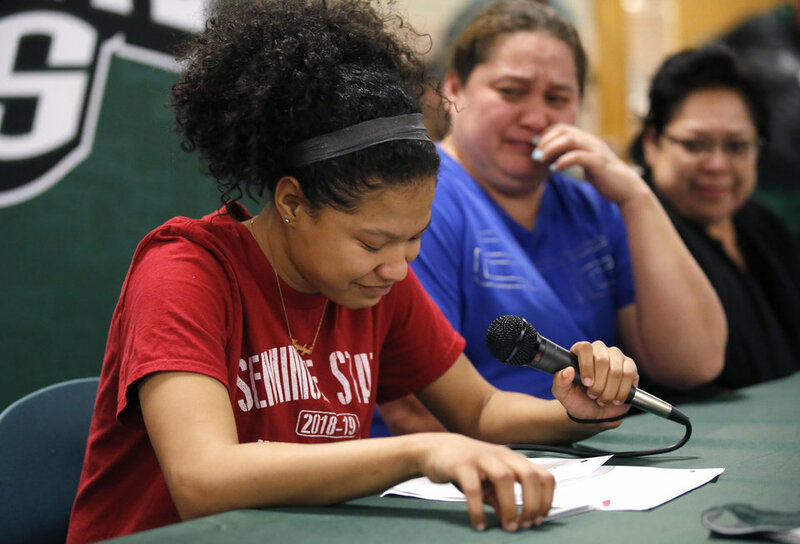 Photo by Jim Beckel, The Oklahoman. 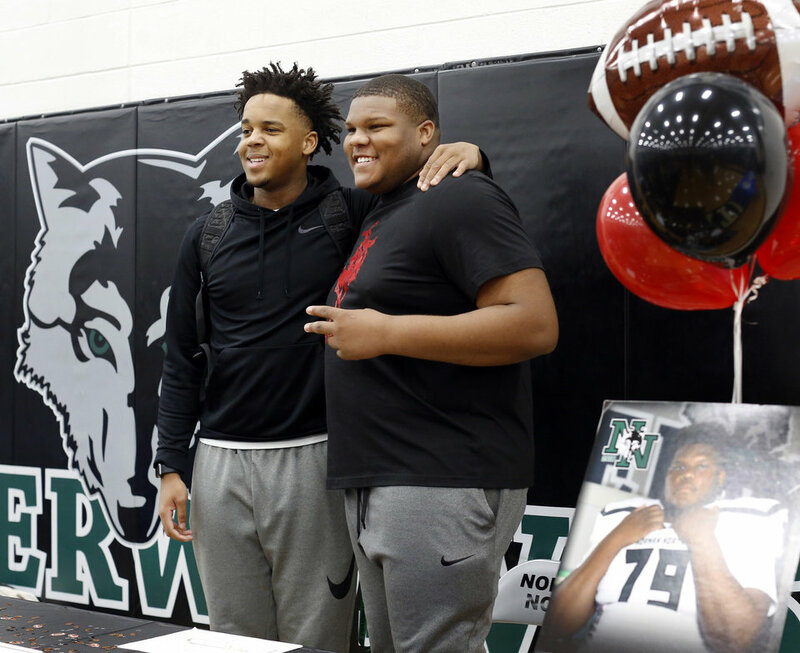 Senior Ja&#39;Vion Combs, right, smiles while posing for a photo with fellow athlete Josh Crutchfield as Combs greeted friends and classmates before signing a letter to play football with Northwestern Oklahoma State University during Signing Day event at Norman North High School on Wednesday, Feb. 6, 2019. 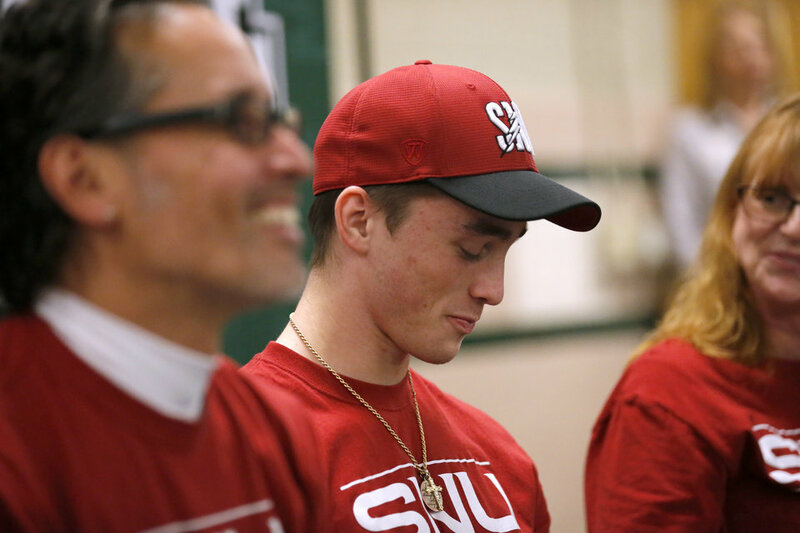 Photo by Jim Beckel, The Oklahoman. 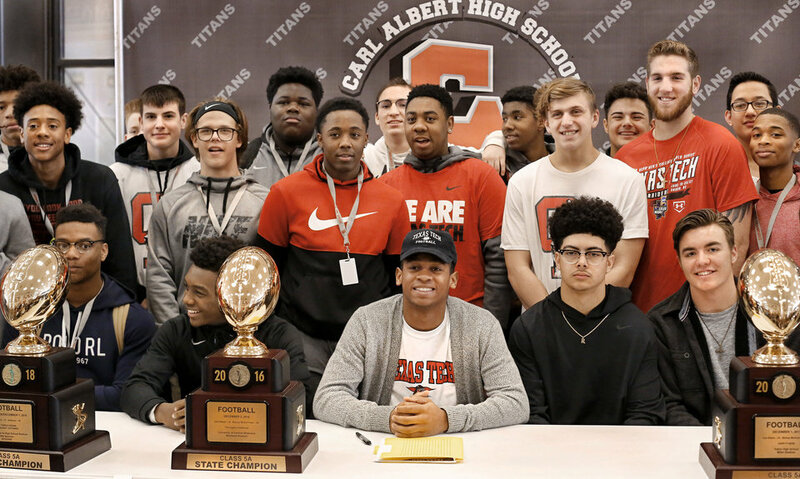 Titans football standout Dadrion Taylor, seated center, smiles while posing with football teammates after he signed letter to play football with Texas Tech University during Signing Day ceremony at Carl Albert High School on Wednesday, Feb. 6, 2019. Photo by Jim Beckel, The Oklahoman. 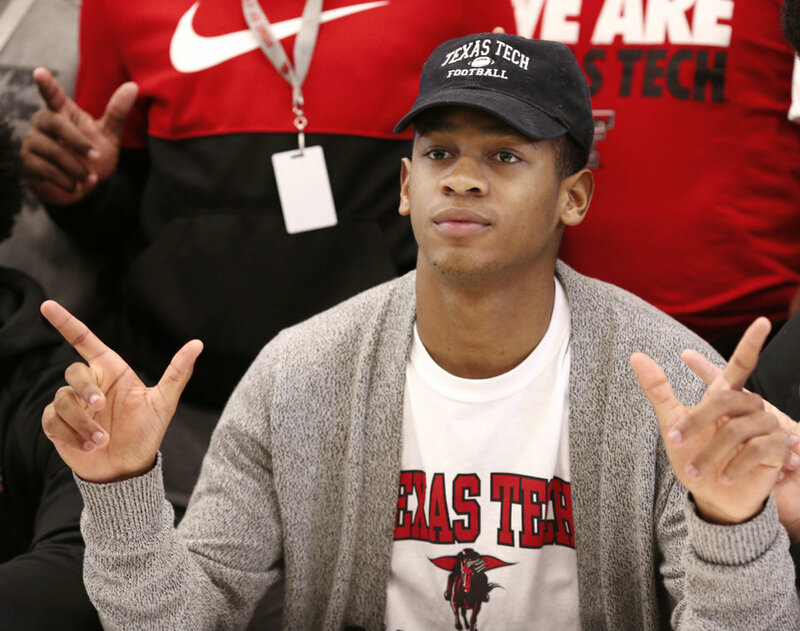 Titans football standout Dadrion Taylor makes the pistols gesture with his hands after he signed letter to play football with Texas Tech University during Signing Day ceremony at Carl Albert High School on Wednesday, Feb. 6, 2019. 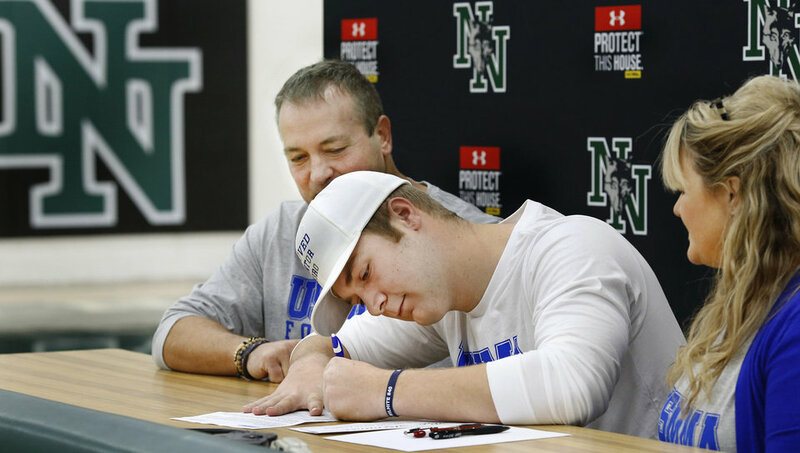 Photo by Jim Beckel, The Oklahoman. 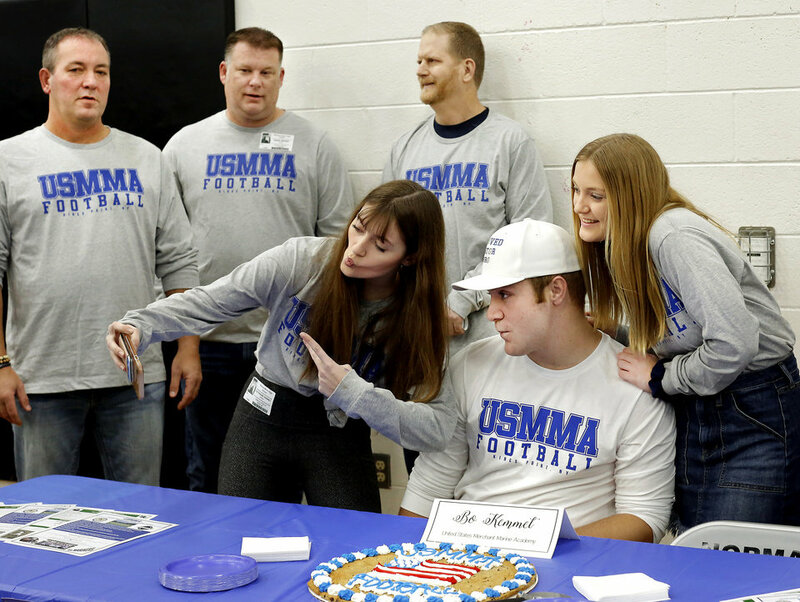 Bo Kemmet&#39;s older sister, Kate, takes a picture of herself, Bo and their younger sister, Meg, 14, at his reception table after he signed to play football with United States Merchant Marines Academy during Signing Day event at Norman North High School on Wednesday, Feb. 6, 2019. 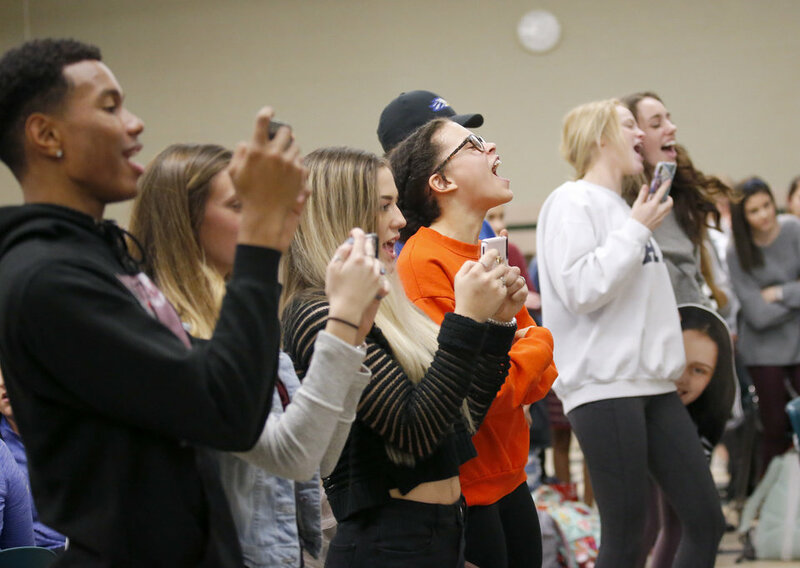 Their dad is in background, at far left. 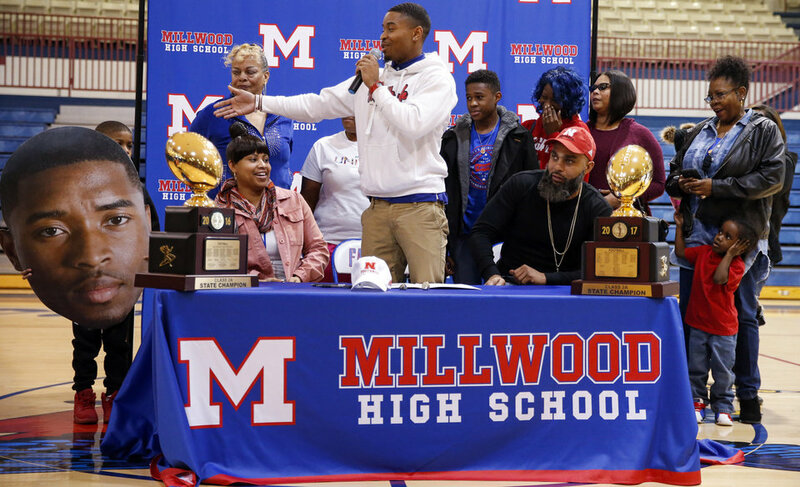 Photo by Jim Beckel, The Oklahoman. 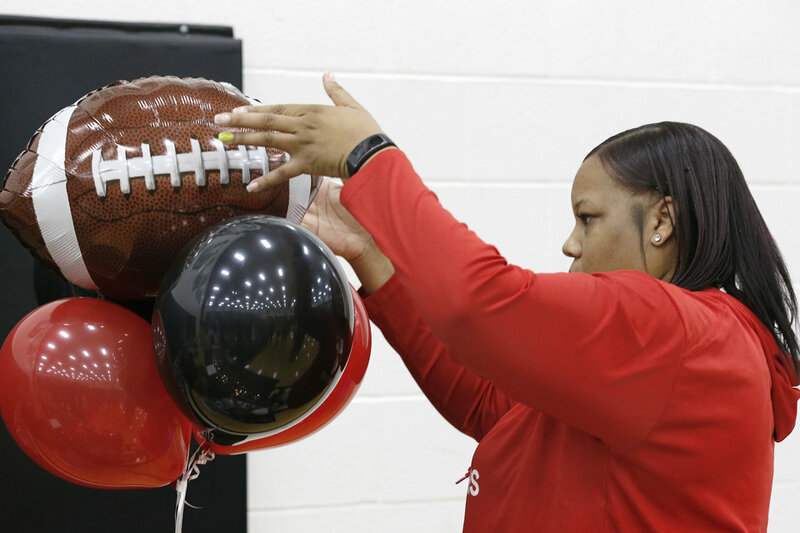 The mother of Ja&#39;Vion Combs straightens a balloon bouquet at the reception table where her son, senior Ja&#39;Vion Combs, would greet classmates and family after he signed letter to play football with Northwestern Oklahoma State University during Signing Day event at Norman North High School on Wednesday, Feb. 6, 2019. 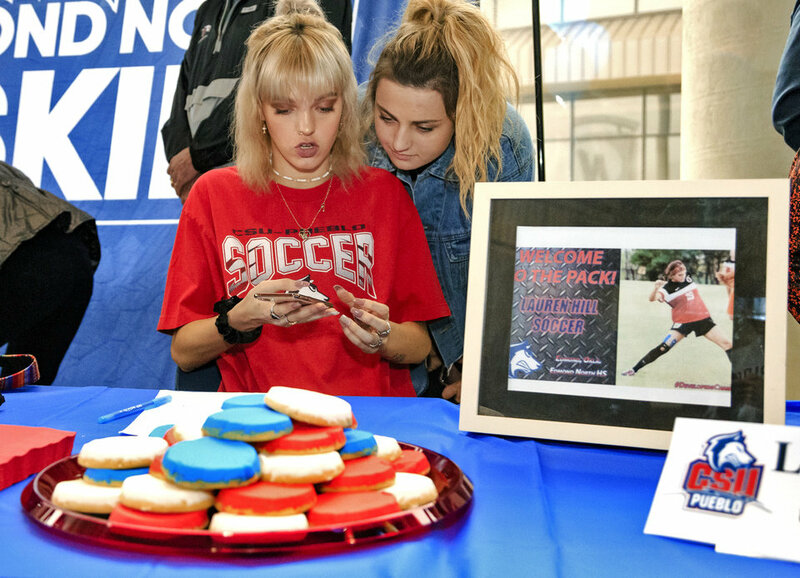 Photo by Jim Beckel, The Oklahoman. 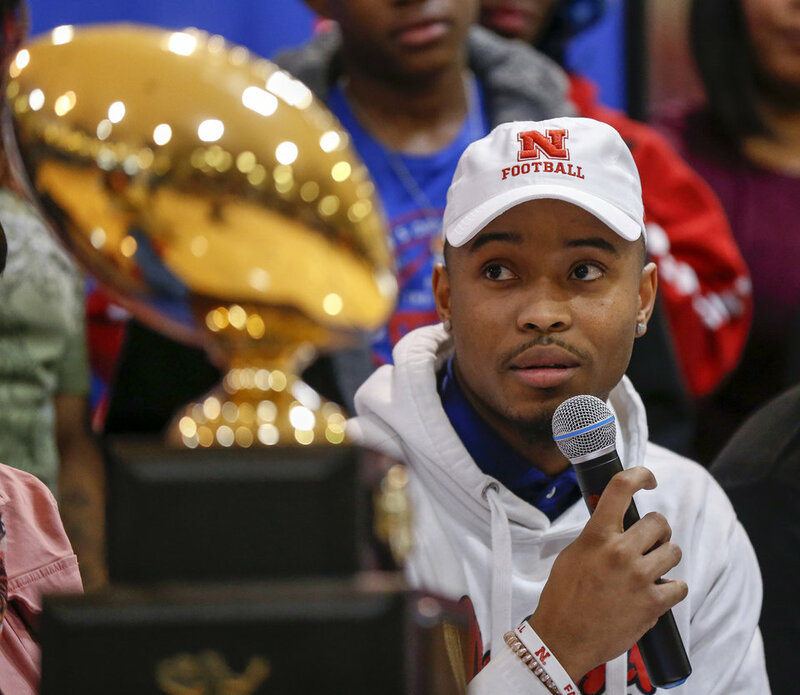 Senior Ja&#39;Vion Combs waits to sign a letter to play football with Northwestern Oklahoma State University during Signing Day event at Norman North High School on Wednesday, Feb. 6, 2019. 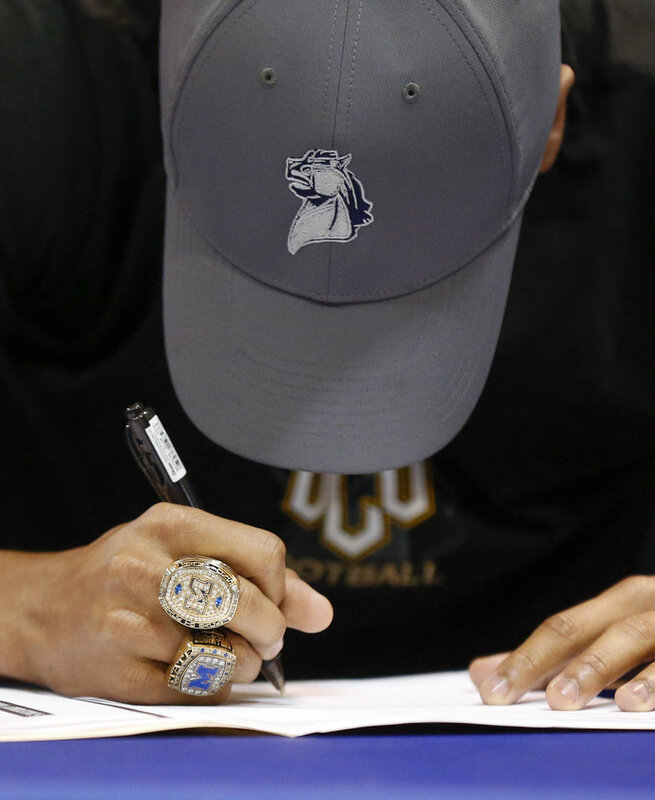 Photo by Jim Beckel, The Oklahoman. 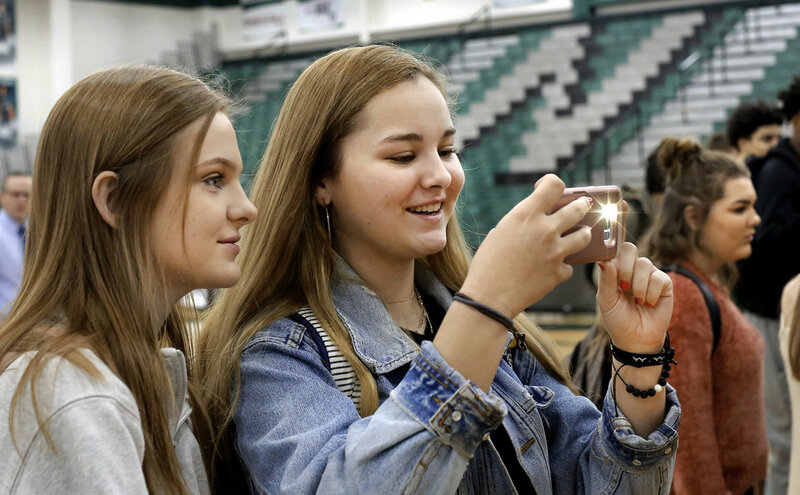 Two students take pictures of their athlete classmates as they sign letters during Signing Day at Norman North High School on Wednesday, Feb. 6, 2019. 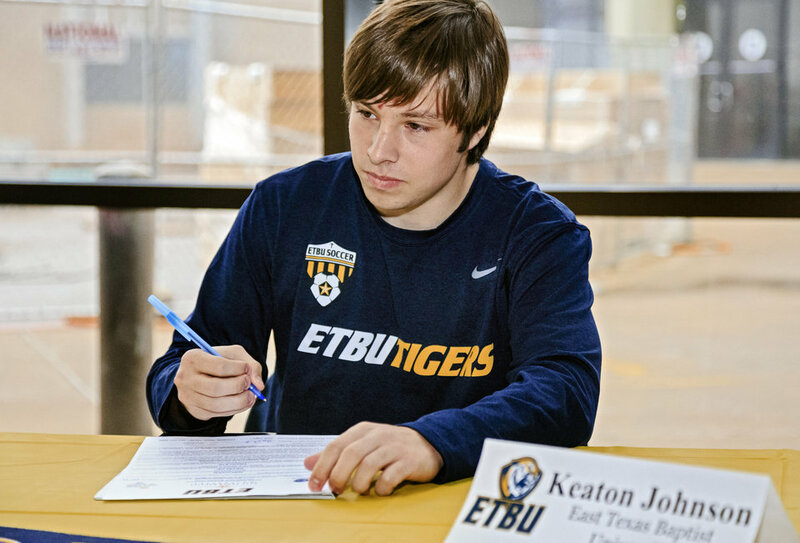 Photo by Jim Beckel, The Oklahoman. 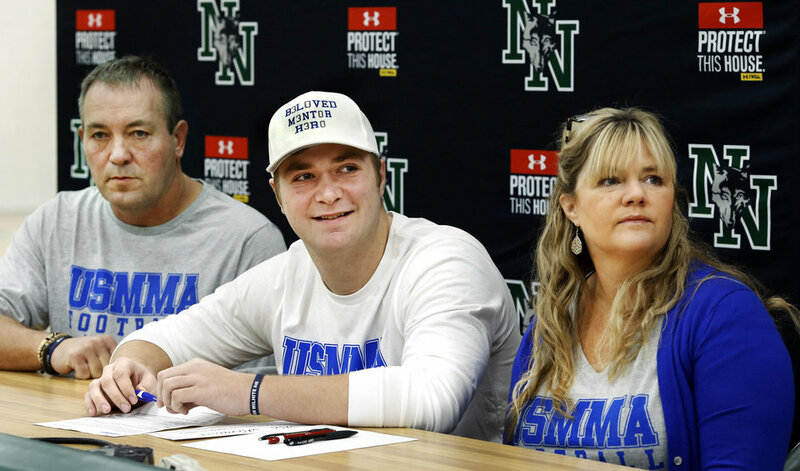 Bo Kemmet smiles as he leans toward his mom for a hug and a kiss after he signed letter to play football with United States Merchant Marines Academy during signing Day event at Norman North High School on Wednesday, Feb. 6, 2019. 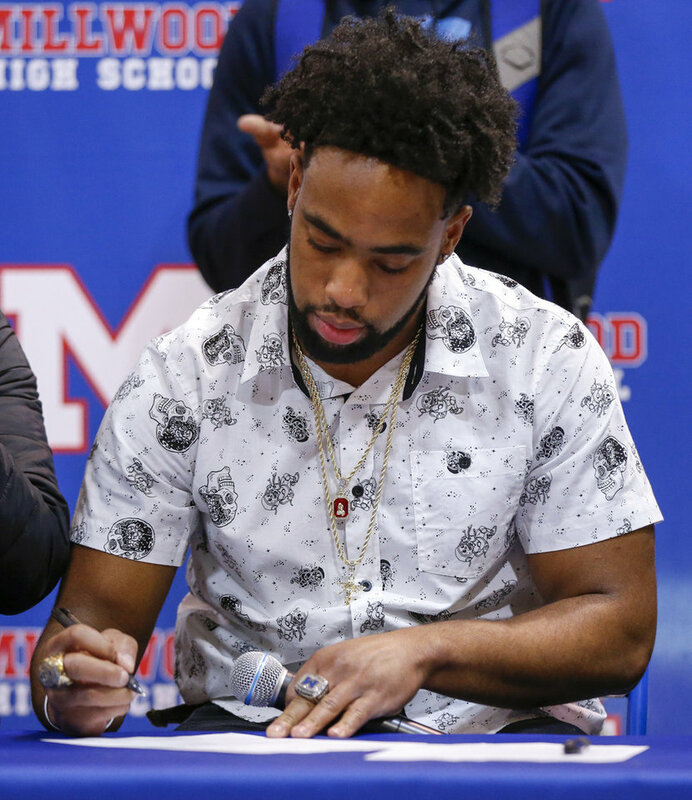 His dad, at left, makes sure his son&#39;s signature is in the right place on the letter. 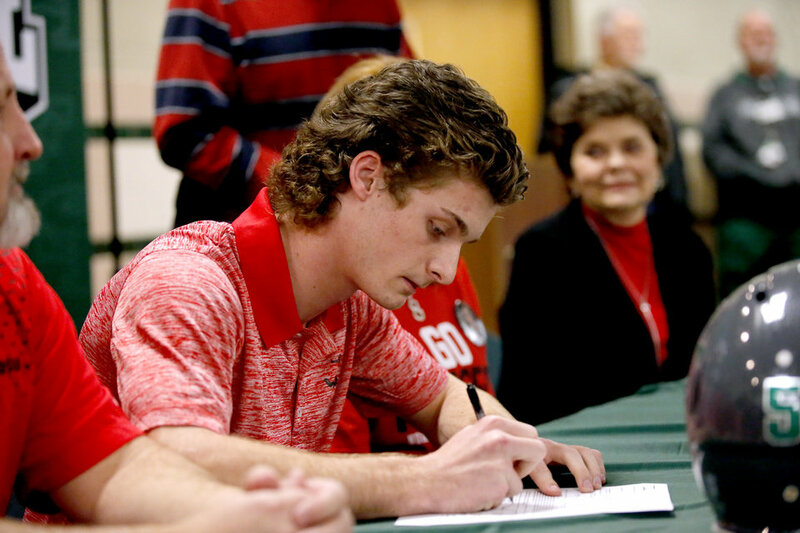 Photo by Jim Beckel, The Oklahoman. 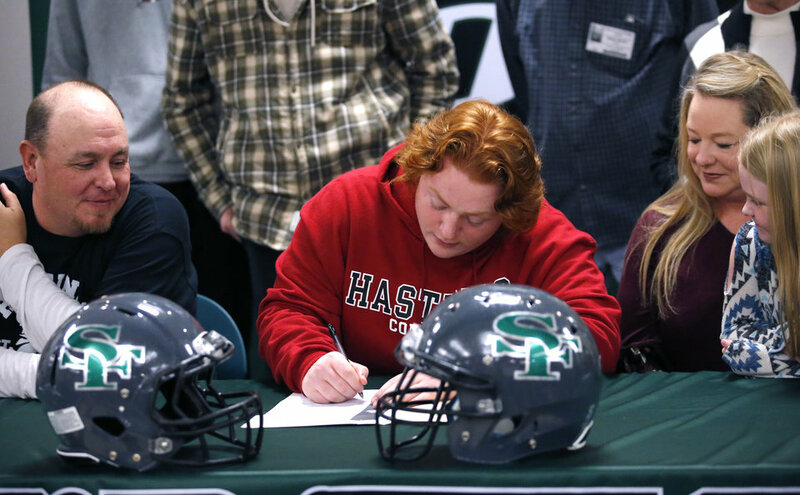 Bo Kemmet sits between his parents as he signs letter to play football with United States Merchant Marines Academy during signing Day event at Norman North High School on Wednesday, Feb. 6, 2019. 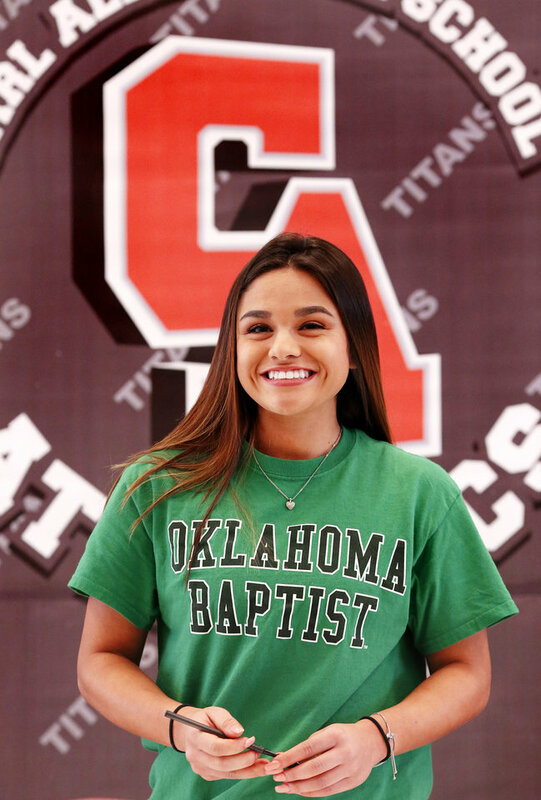 Photo by Jim Beckel, The Oklahoman. 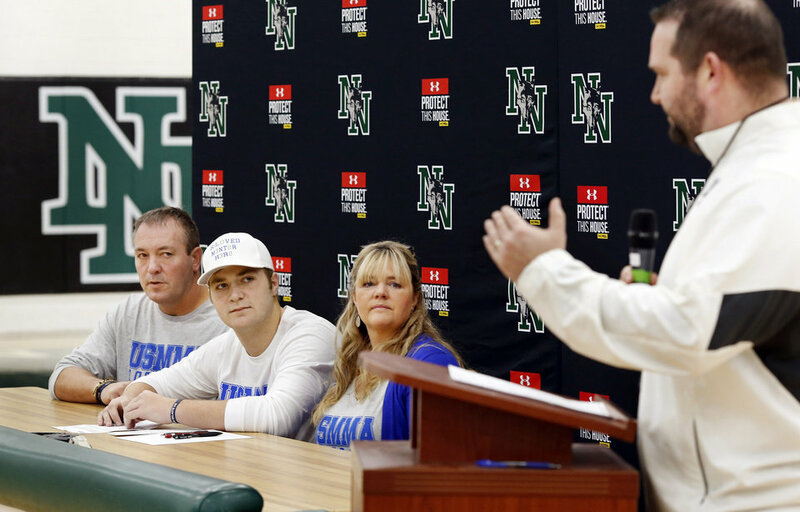 Bo Kemmet sits between his parents as they listen to remarks about Kemmet&#39;s high school career before he signs to play football with United States Merchant Marines Academy during signing Day event at Norman North High School on Wednesday, Feb. 6, 2019. 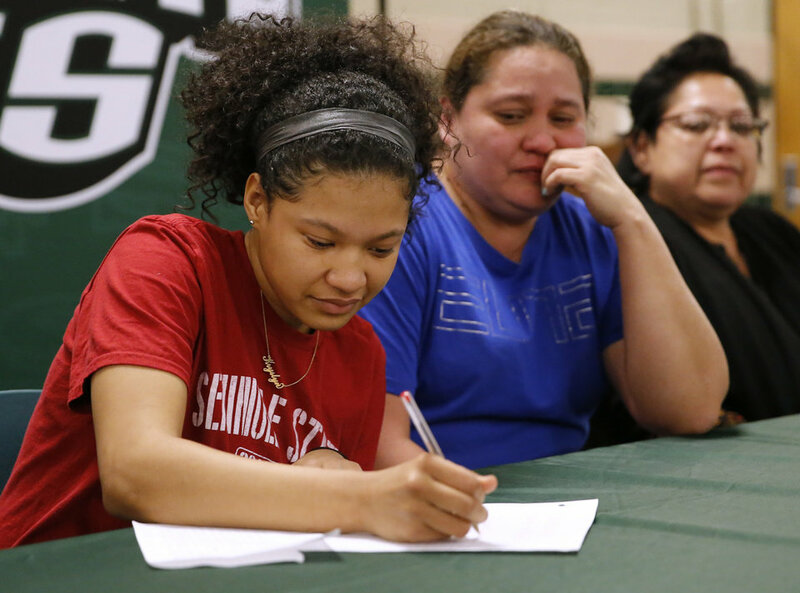 Photo by Jim Beckel, The Oklahoman. 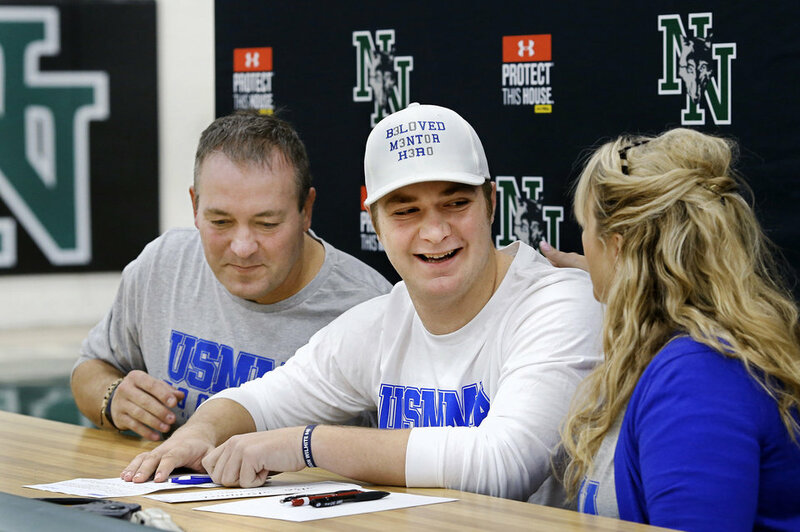 Bo Kemmet sits between his parents as he waits to sign to play football with United States Merchant Marines Academy during signing Day event at Norman North High School on Wednesday, Feb. 6, 2019. 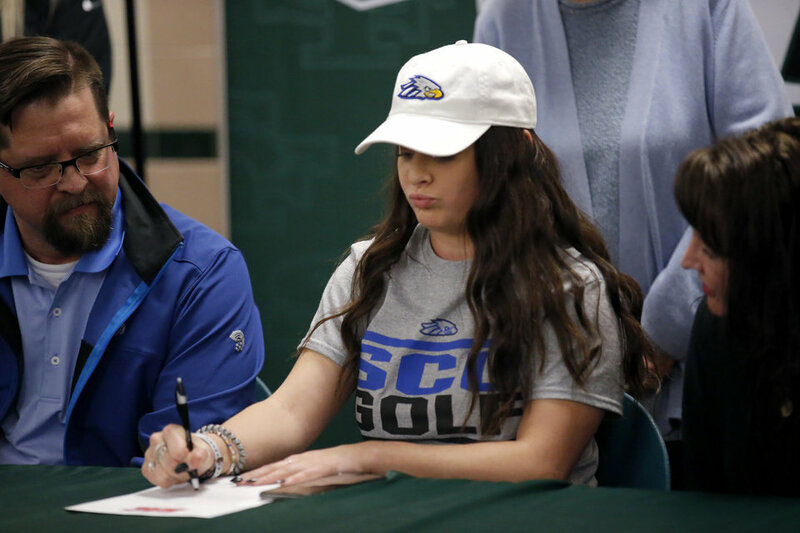 Photo by Jim Beckel, The Oklahoman. 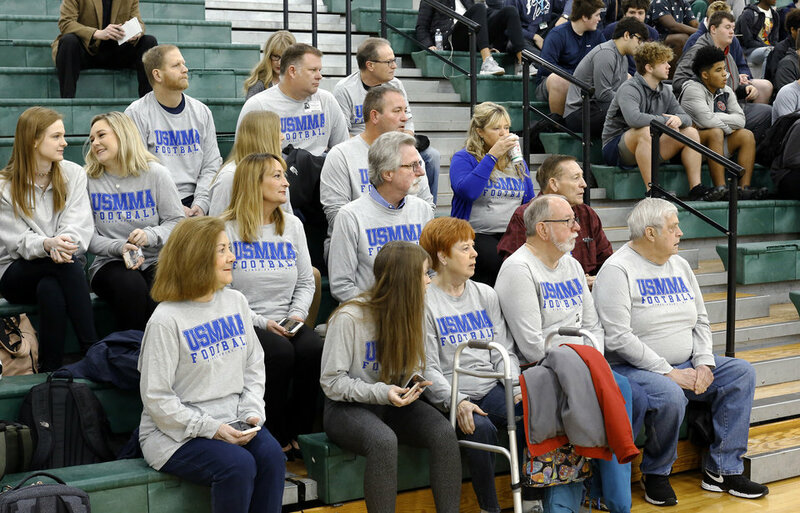 Family and friends of Bo Kemmet were in the gym to watch him sign with United States Merchant Marines Academy during signing Day event at Norman North High School on Wednesday, Feb. 6, 2019. 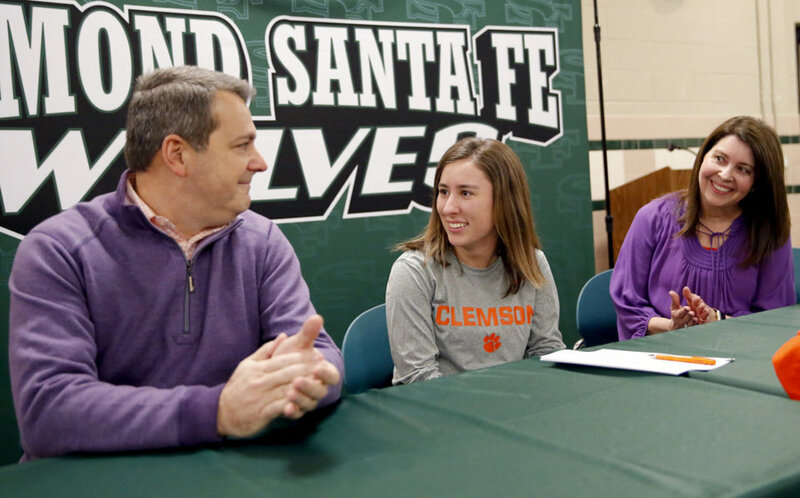 Photo by Jim Beckel, The Oklahoman. 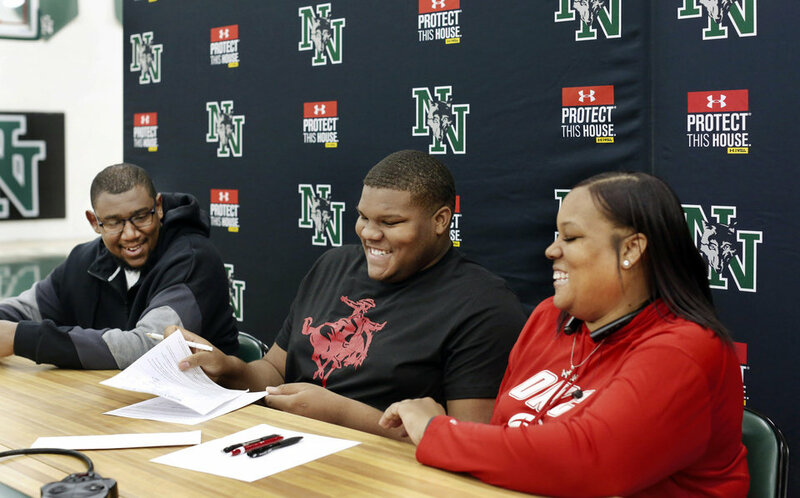 Seated between his parents, senior Ja&#39;Vion Combs grins after signing his name to a letter to play football with Northwestern Oklahoma State University during Signing Day event at Norman North High School on Wednesday, Feb. 6, 2019. 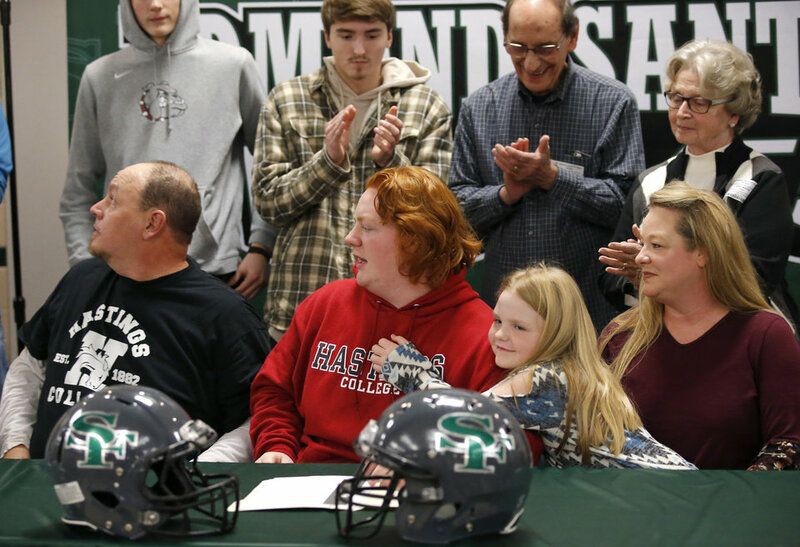 Photo by Jim Beckel, The Oklahoman. 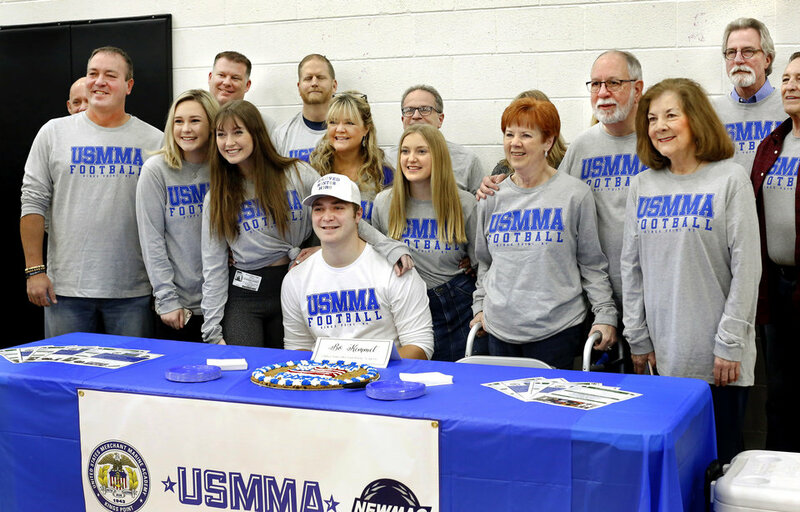 Bo Kemmet is surrounded by family and friends who are posing for a photo after the Norman North senior signed to play football with United States Merchant Marines Academy during signing Day event at Norman North High School on Wednesday, Feb. 6, 2019. 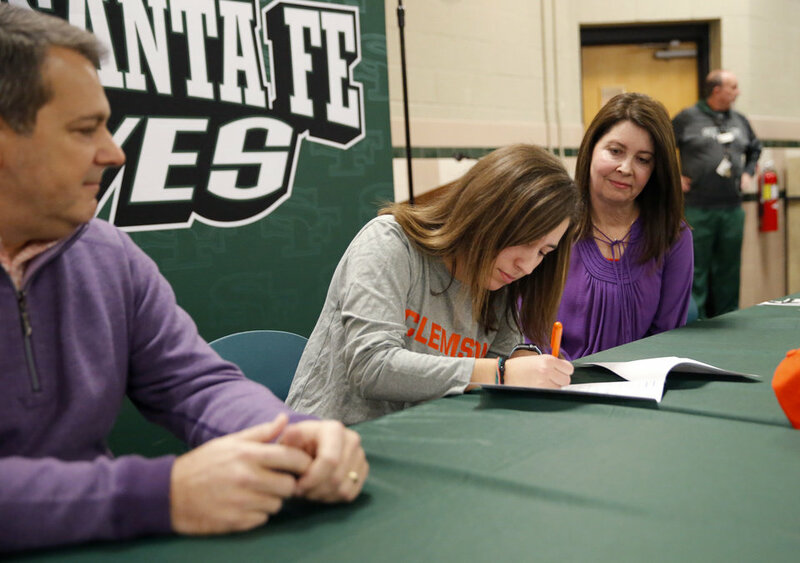 Photo by Jim Beckel, The Oklahoman. 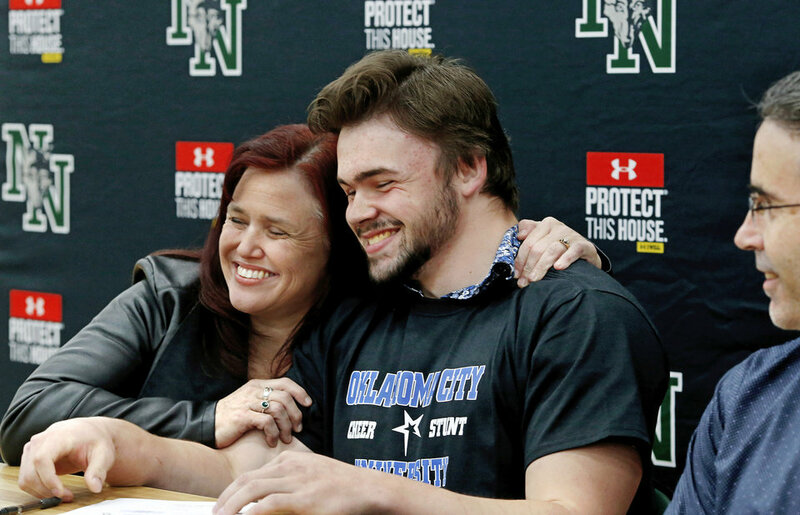 Shawn Yohn hugs her son, Blake, after watching him sign a letter for track and for cheer at Oklahoma City University during Signing Day event at Norman North High School on Wednesday, Feb. 6, 2019. At right is Blake&#39;s, dad, Chris. 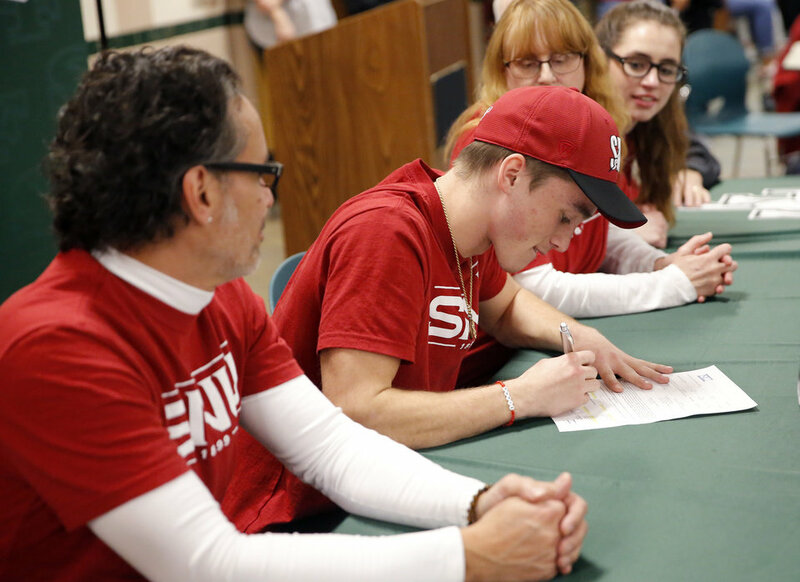 Photo by Jim Beckel, The Oklahoman. 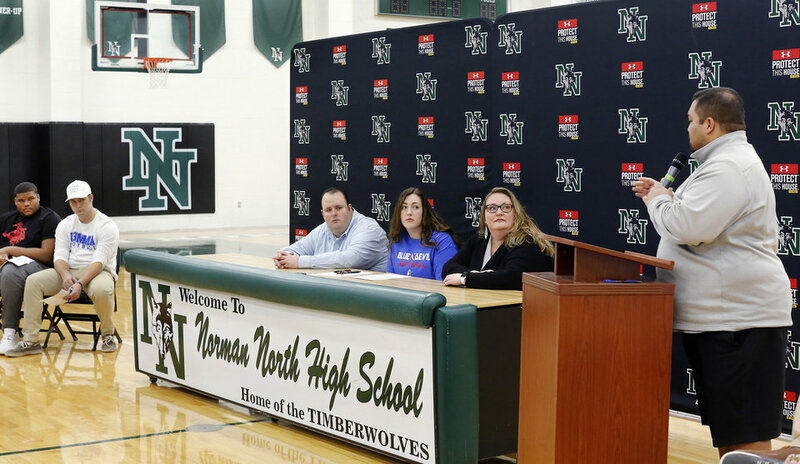 Alex Martin signs letter to play softball at Kansas City Kansas Community College during Signing Day event at Norman North High School on Wednesday, Feb. 6, 2019. Her parents are seated at the table with her. 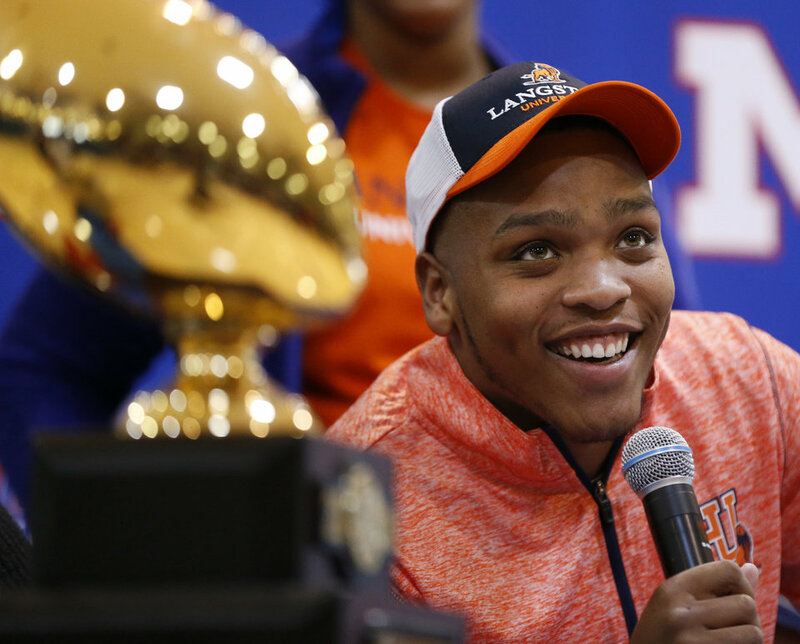 Photo by Jim Beckel, The Oklahoman. 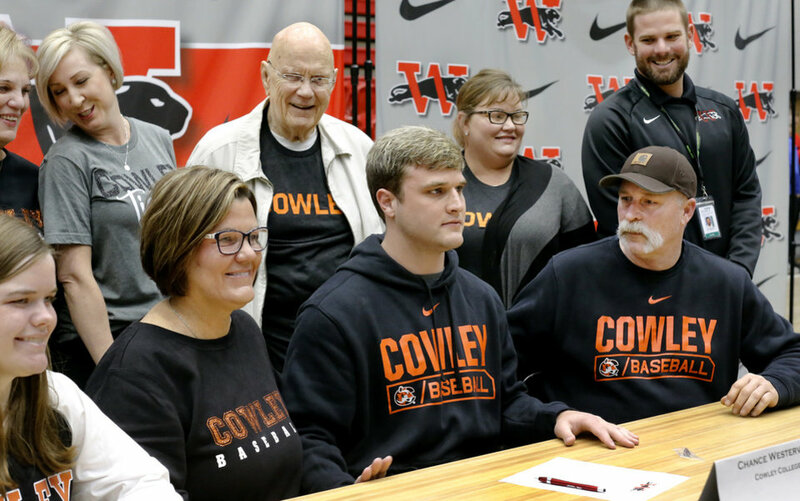 Chance Westervelt, center, sits with his parents as family stand behind to watch him sign letter to play baseball at Cowley College during Signing Day at Westmoore High School on Wednesday, Feb. 6, 2019. 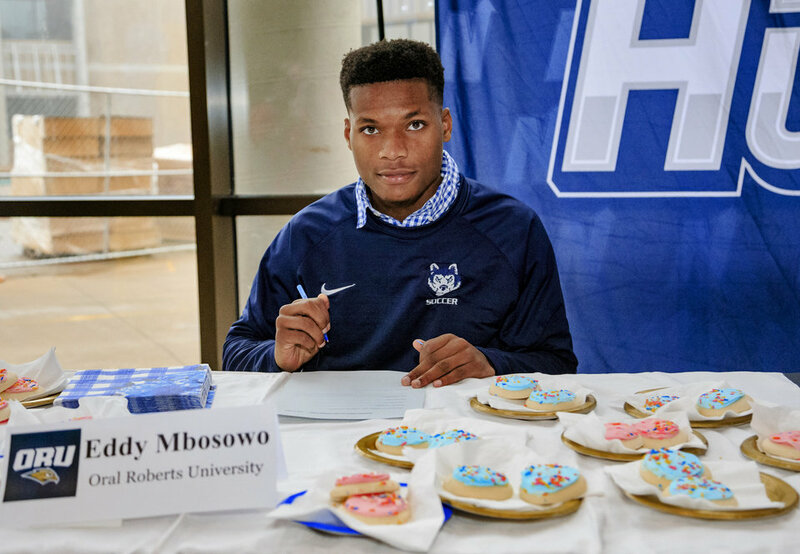 Photo by Jim Beckel, The Oklahoman. 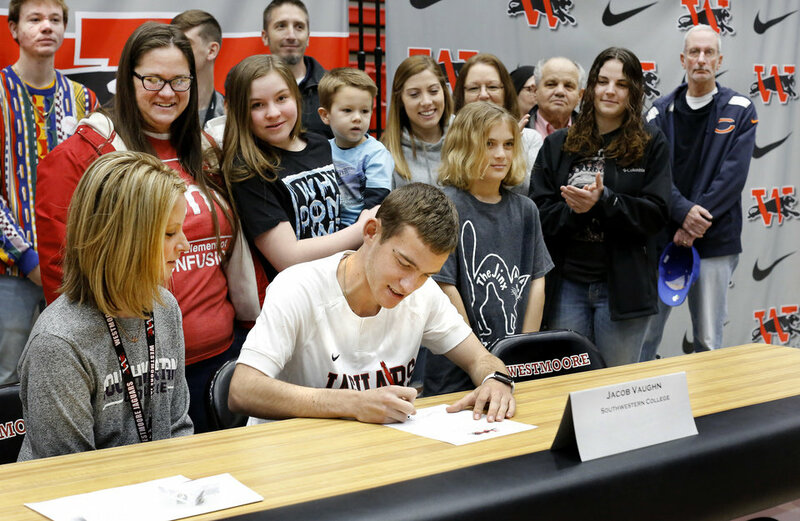 Jacob Clark poses with his family after signing a letter during Signing Day event at Westmoore High School on Wednesday, Feb. 6, 2019. 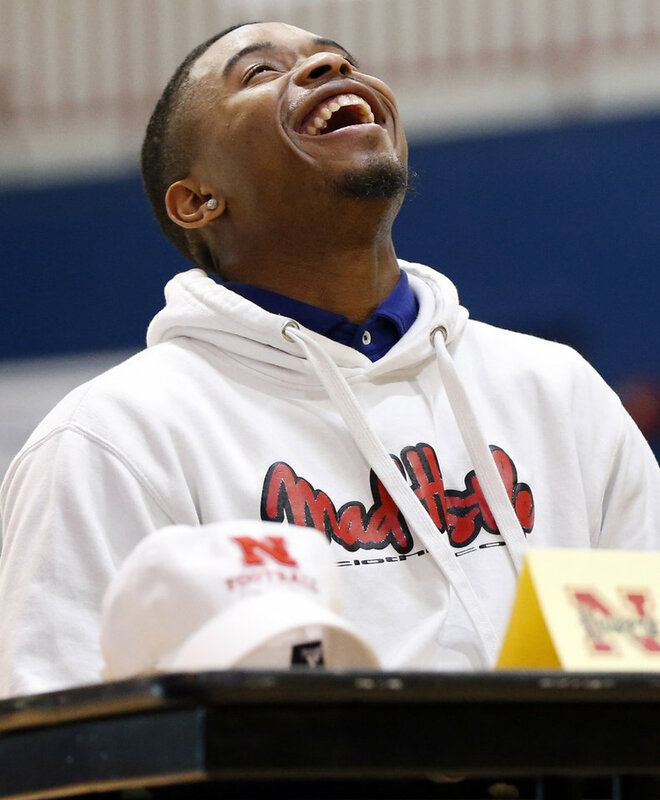 Photo by Jim Beckel, The Oklahoman. 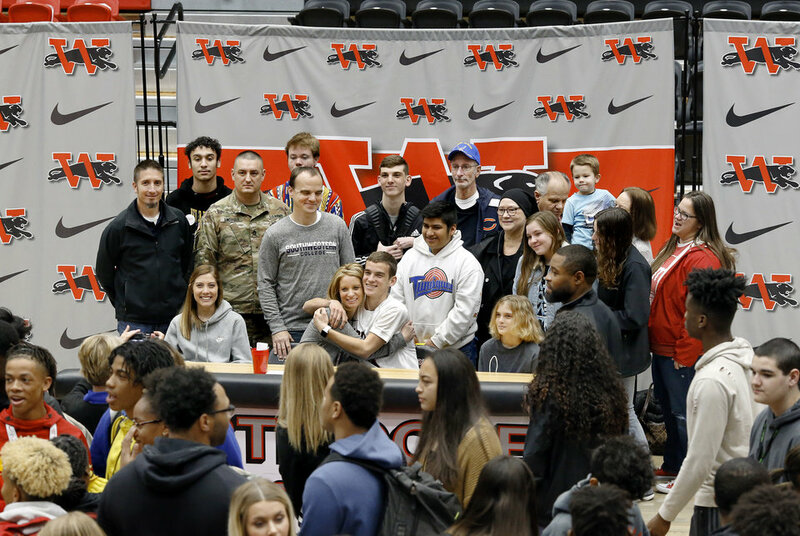 Jacob Vaughn poses with friends and extended family after all athletes had signed letters during Signing Day event at Westmoore High School on Wednesday, Feb. 6, 2019. Photo by Jim Beckel, The Oklahoman. 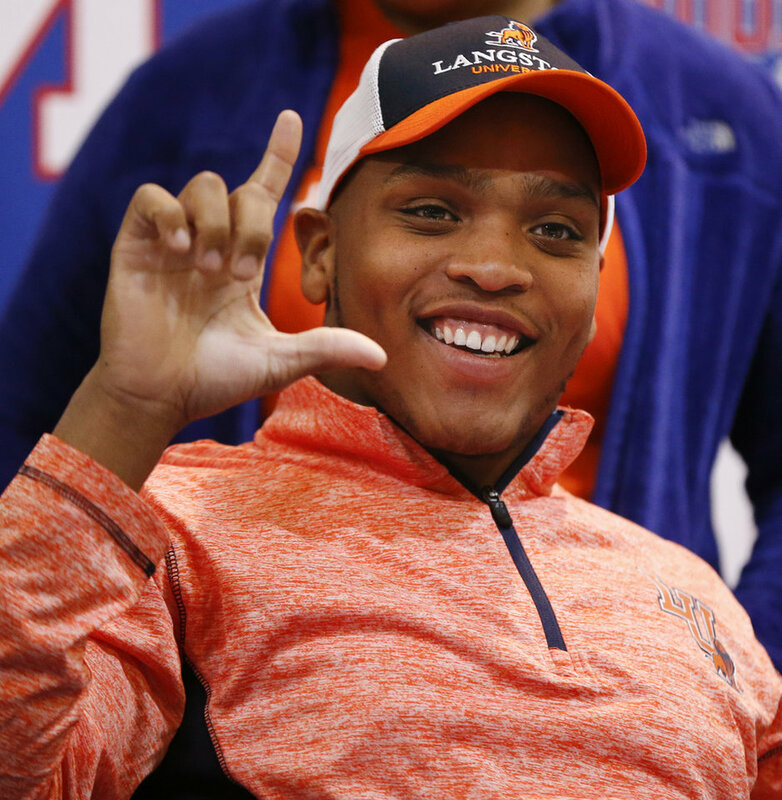 Kerry Shaw poses after putting a ball cap from East Central University after signing letter to play at the Ada school during Signing Day event at Westmoore High School on Wednesday, Feb. 6, 2019. 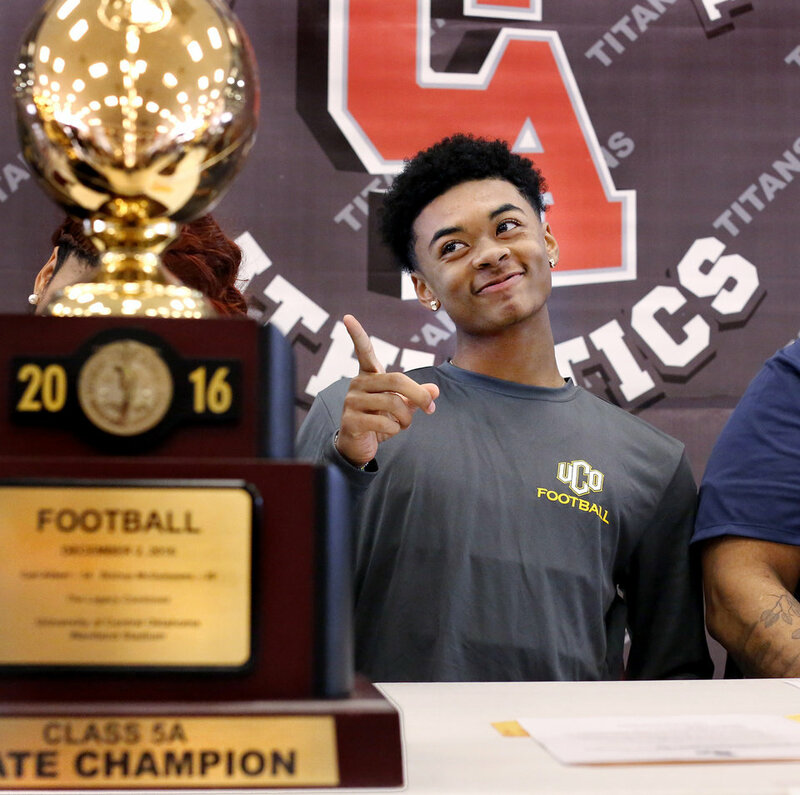 Photo by Jim Beckel, The Oklahoman. 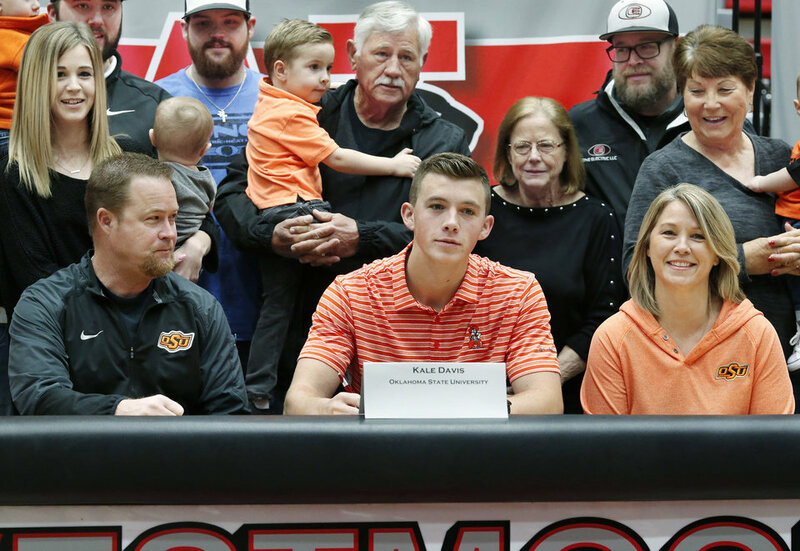 Kale Davis poses with his family after signing letter to play baseball at Oklahoma State University during Signing Day event at Westmoore High School on Wednesday, Feb. 6, 2019. 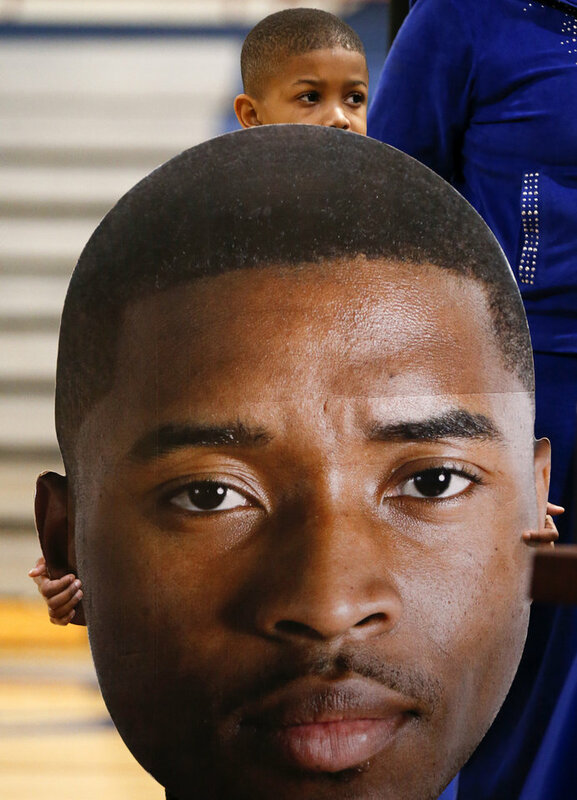 Photo by Jim Beckel, The Oklahoman. 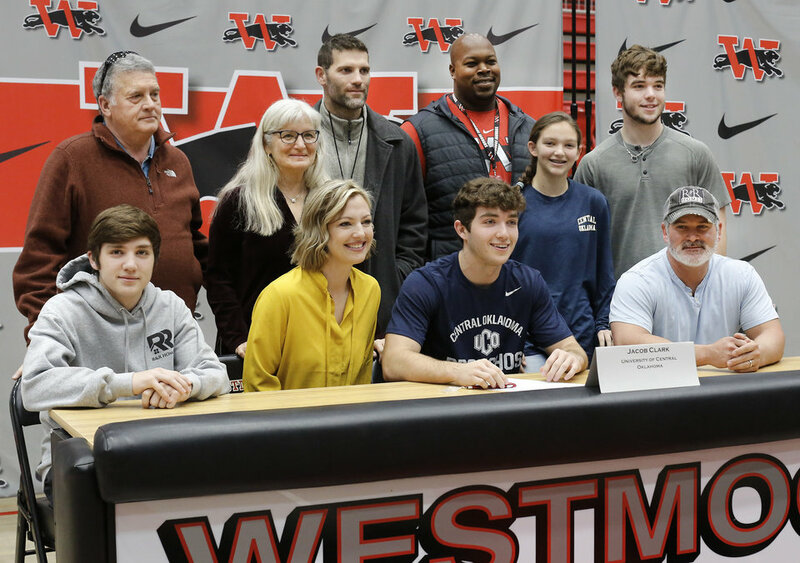 Layne Grantham signs a letter to play at University of Central Oklahoma during Signing Day event at Westmoore High School on Wednesday, Feb. 6, 2019. 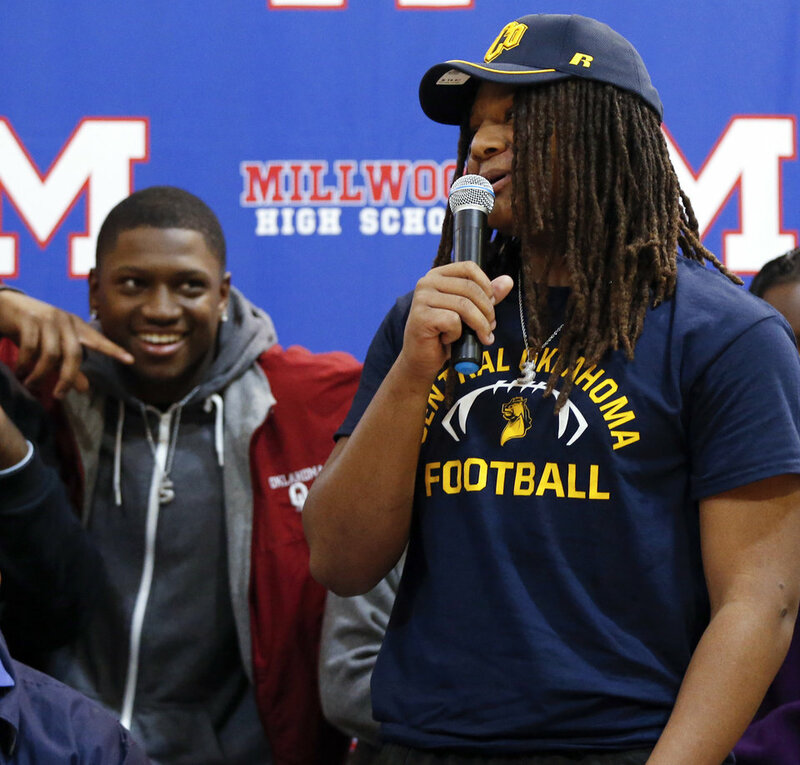 Photo by Jim Beckel, The Oklahoman. 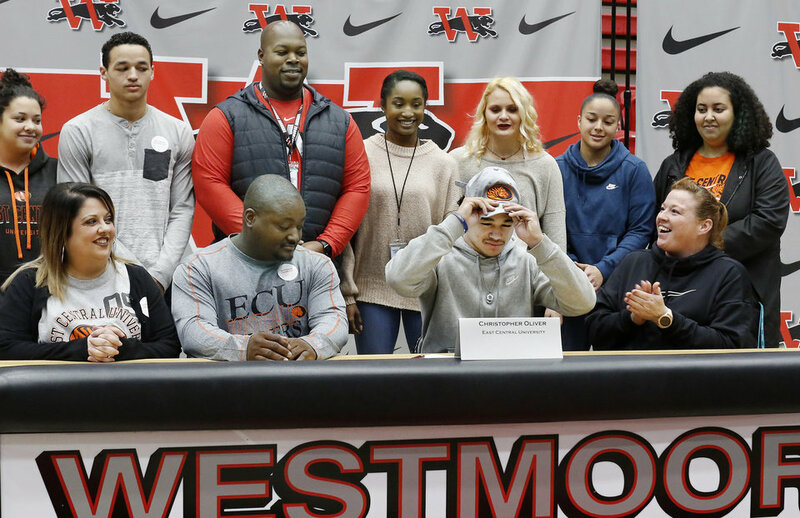 Christopher Oliver puts on a baseball cap after signing letter with East Central University during Signing Day event at Westmoore High School on Wednesday, Feb. 6, 2019. 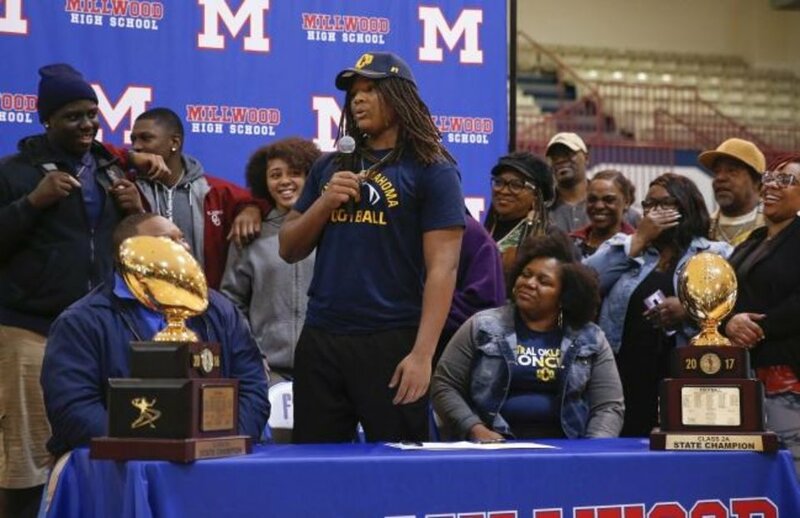 Photo by Jim Beckel, The Oklahoman. 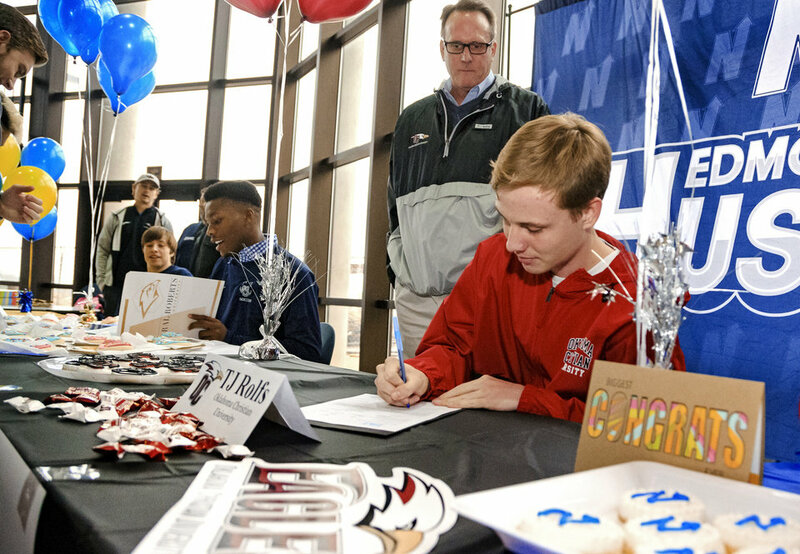 Jacob Vaughn signs his name to letter during Signing Day event at Westmoore High School on Wednesday, Feb. 6, 2019. 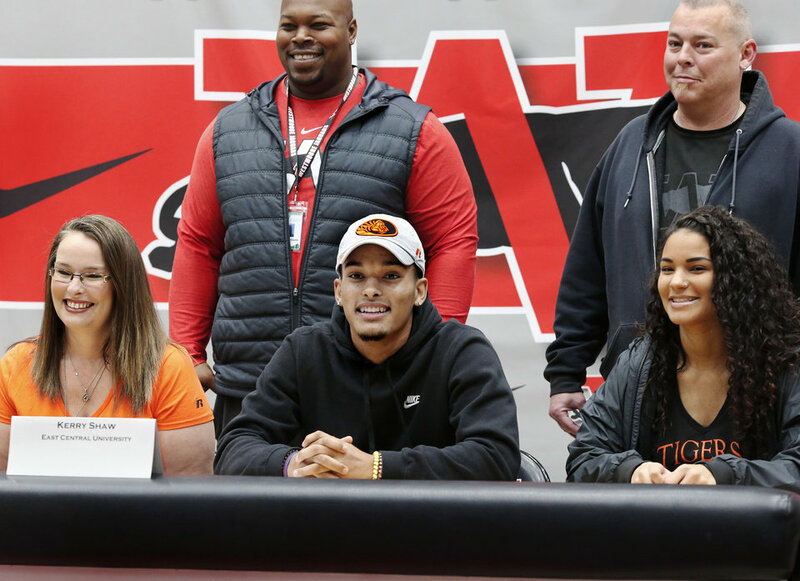 Photo by Jim Beckel, The Oklahoman. 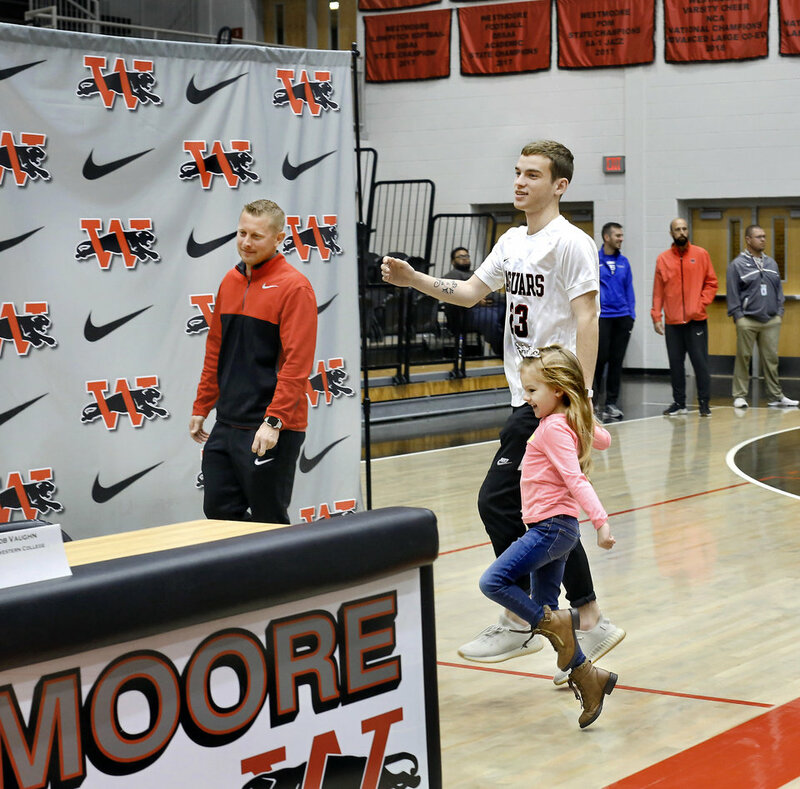 Jacob Vaughn is led to the signing table by his cousin, Brinley Vaughn, who held Jacob&#39;s hand as they skipped across the gym floor before being joined by other family members who witnessed the Westmoore senior place his signature to a letter during Signing Day event at Westmoore High School on Wednesday, Feb. 6, 2019. Brinley Vaughn celebrates her sixth birthday on Thursday. 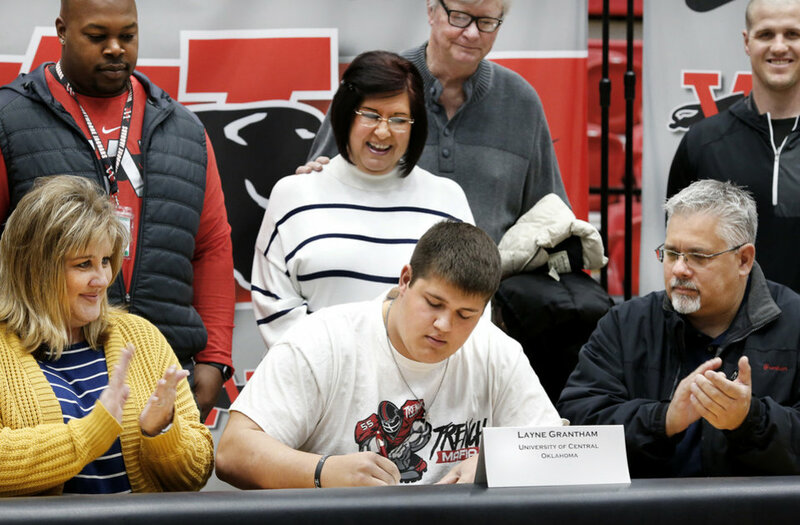 Photo by Jim Beckel, The Oklahoman. 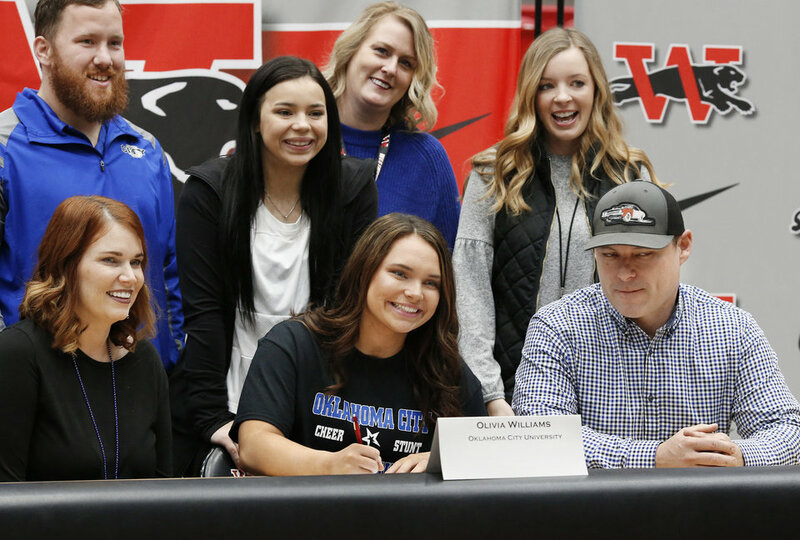 Olivia Williams signs letter to attend Oklahoma City University during Signing Day event at Westmoore High School on Wednesday, Feb. 6, 2019. 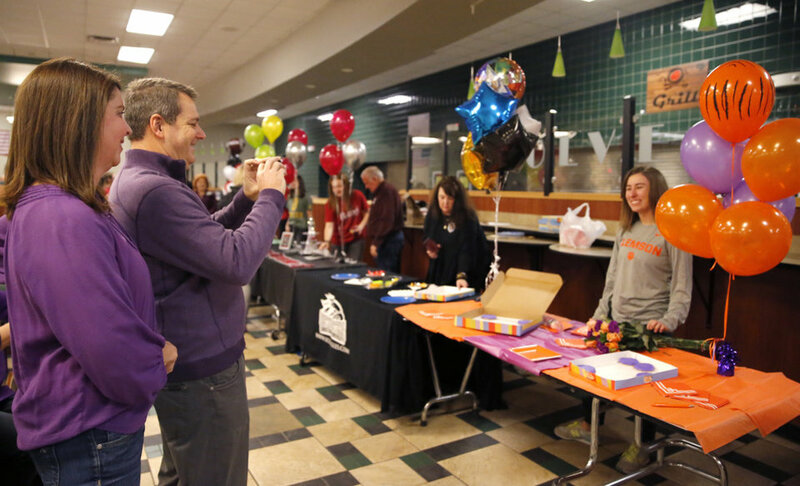 Photo by Jim Beckel, The Oklahoman. 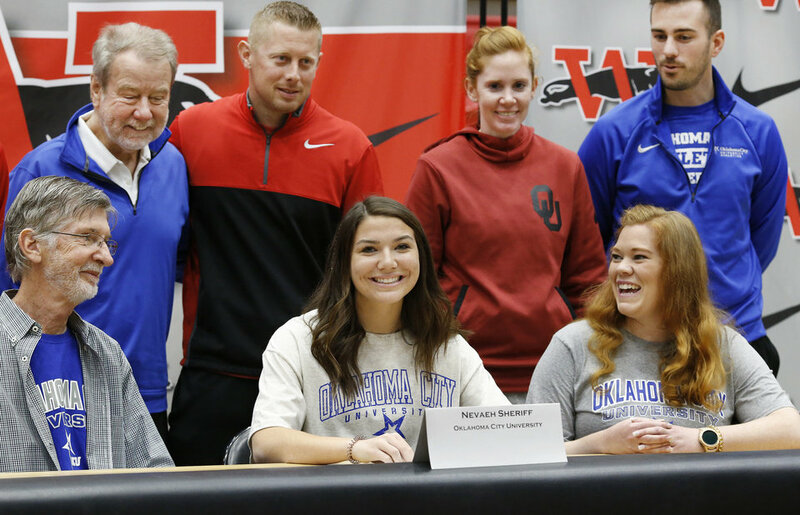 Nevaeh Sheriff smiles after signing letter to play at Oklahoma City University during Signing Day event at Westmoore High School on Wednesday, Feb. 6, 2019. 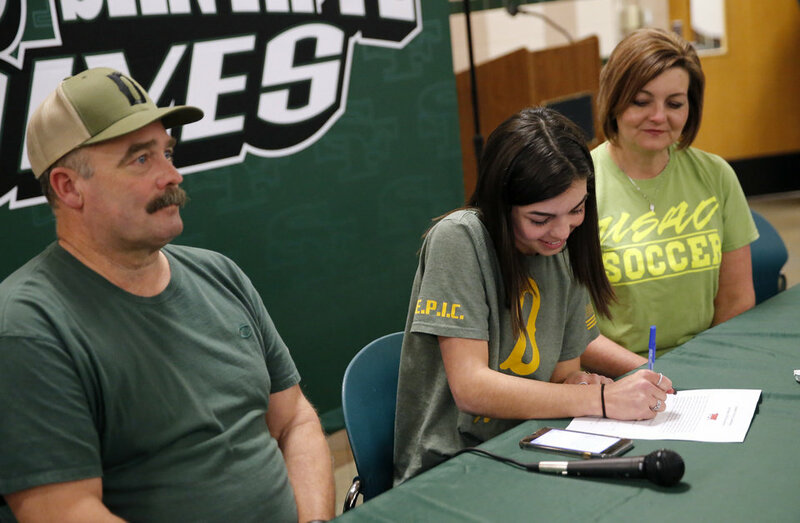 Photo by Jim Beckel, The Oklahoman. 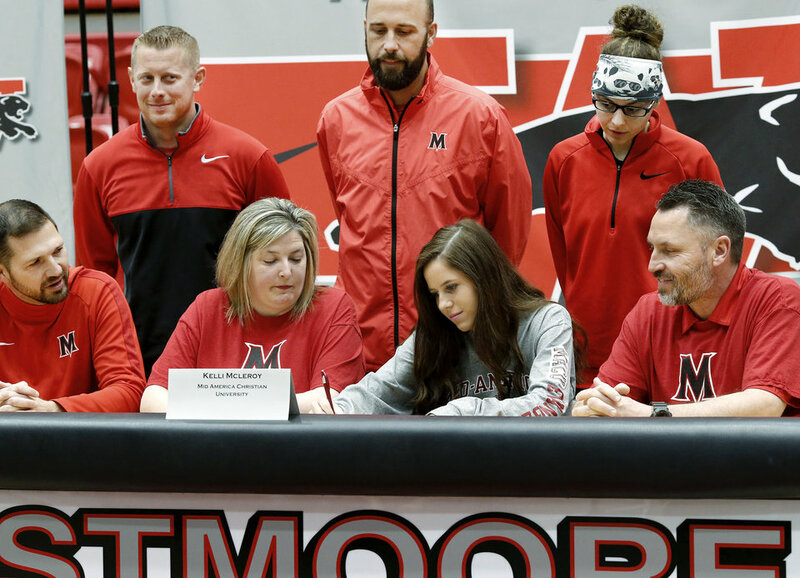 Kelli McLeroy signs letter to play at Mid America Christian University during Signing Day event at Westmoore High School on Wednesday, Feb. 6, 2019. Photo by Jim Beckel, The Oklahoman. 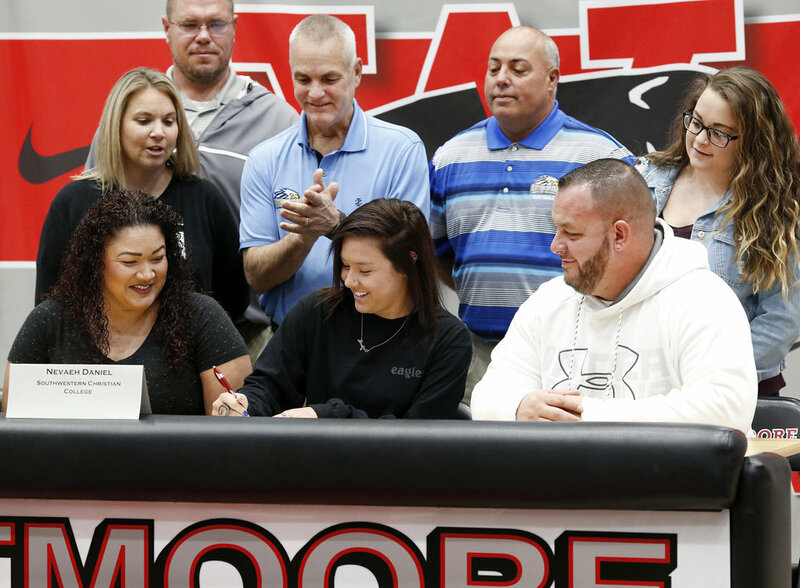 Nevaeh Daniel signs letter to play at Southwestern Christian College during Signing Day event at Westmoore High School on Wednesday, Feb. 6, 2019. Photo by Jim Beckel, The Oklahoman. 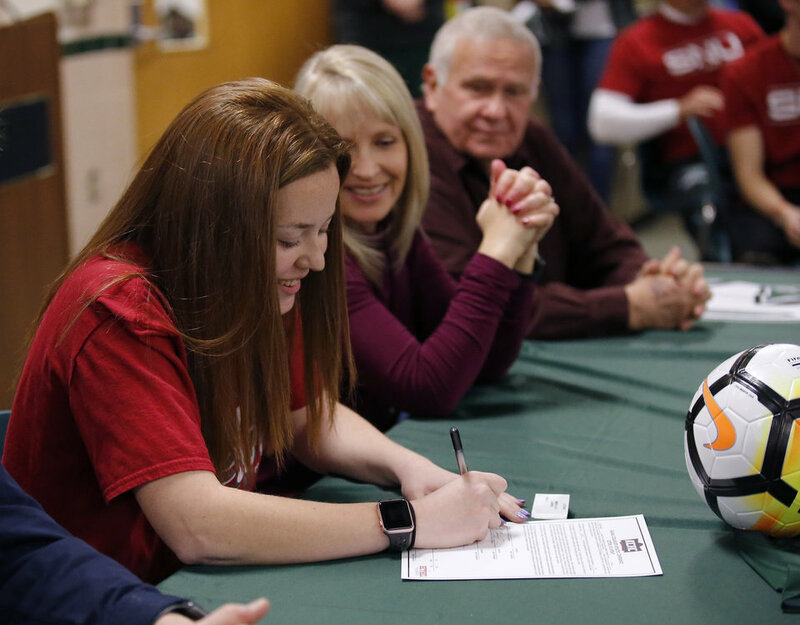 Alex Martin is seated at the signing table with her parents during Signing Day event at Norman North High School on Wednesday, Feb. 6, 2019. 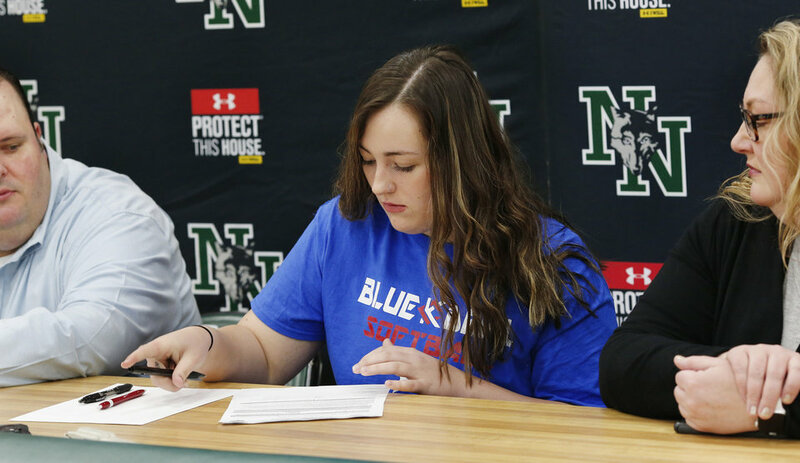 Martin signed to play softball at Kansas City Kansas Community College. Photo by Jim Beckel, The Oklahoman. 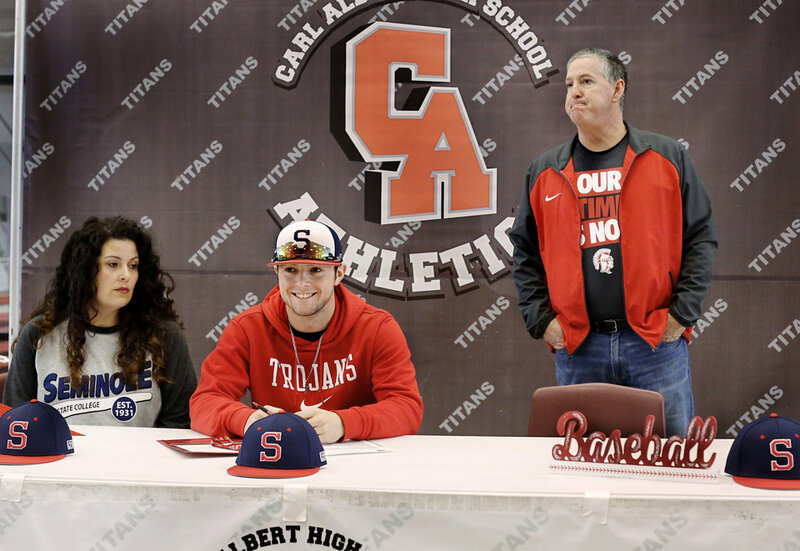 Carter LaValley is joined by his mom and Tim LaValley, his dad/coach, at a table where Carter signed a letter to play baseball at Seminole State College during Signing Day ceremony at Carl Albert High School on Wednesday, Feb. 6, 2019. Photo by Jim Beckel, The Oklahoman. 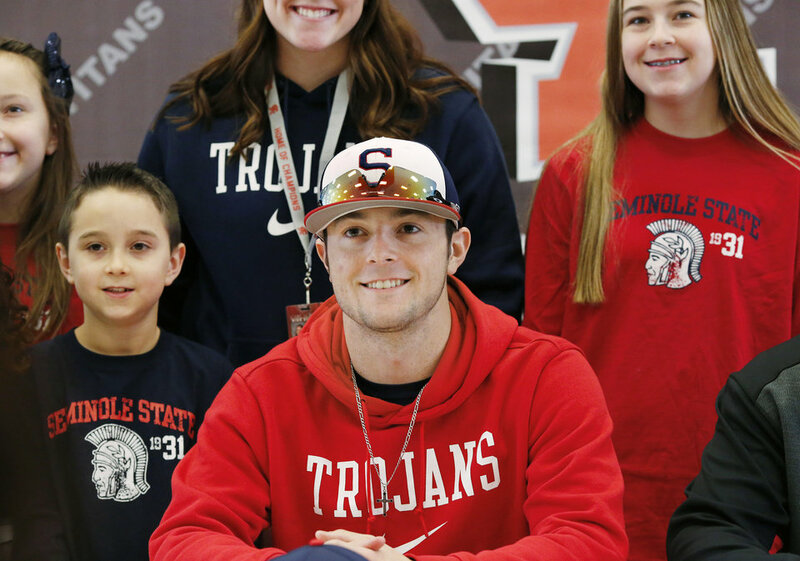 With his siblings standing near him, Carter LaValley, poses for a picture after the senior signed a letter to play at Seminole State College during Signing Day ceremony at Carl Albert High School on Wednesday, Feb. 6, 2019. Photo by Jim Beckel, The Oklahoman. 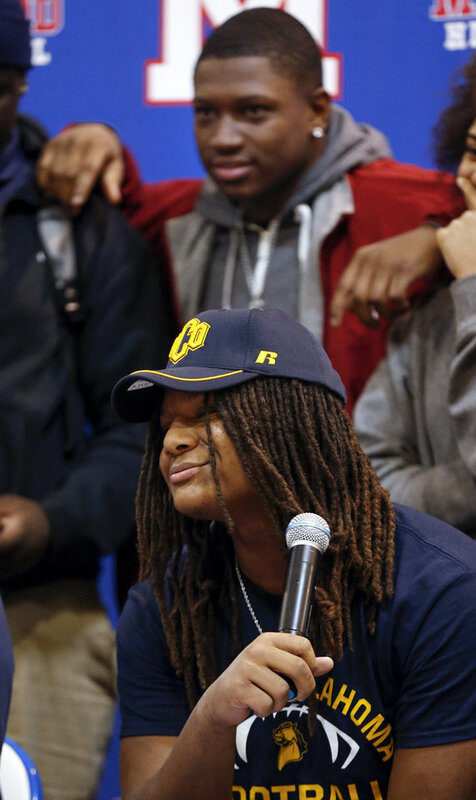 Titans senior Anthony Davis smiles as he sits with teammates for a group photo after he signed letter to play at UCO during Signing Day ceremony at Carl Albert High School on Wednesday, Feb. 6, 2019. 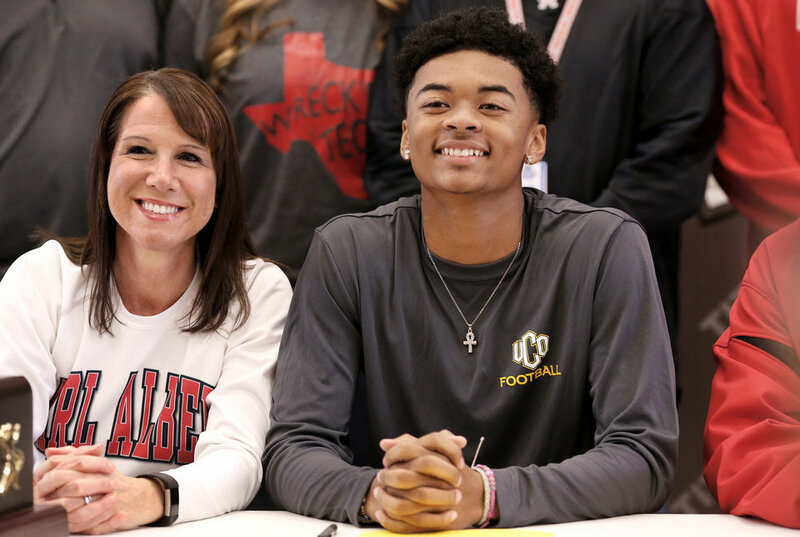 At left is Kimberly Davis, Carl Albert High School&#39;s athletic trainer. Photo by Jim Beckel, The Oklahoman. 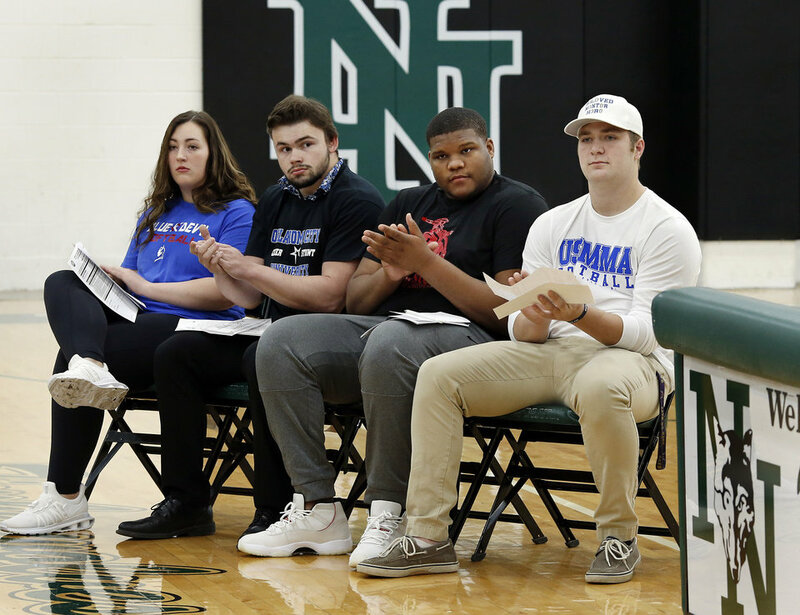 Athletes sit together briefly for a group photo after they signed individual letters to play at various schools during Signing Day event at Norman North High School on Wednesday, Feb. 6, 2019, are, from left, Blake Yohn (Track/Cheer), Ja&#39;Vion Combs (football), Alex Martin (softball), and Bo Kemmet (football). Photo by Jim Beckel, The Oklahoman. 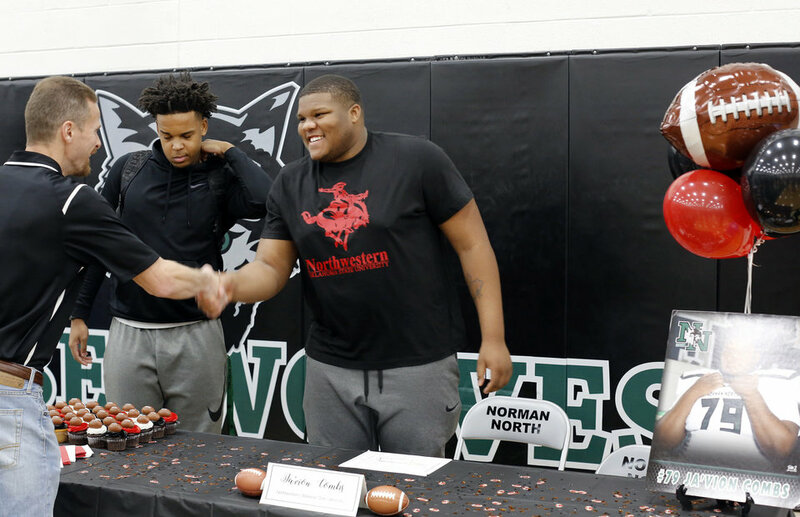 Senior Ja&#39;Vion Combs, right, smiles while greeting classmates, coaches and friends before signing a letter to play football with Northwestern Oklahoma State University during Signing Day event at Norman North High School on Wednesday, Feb. 6, 2019. 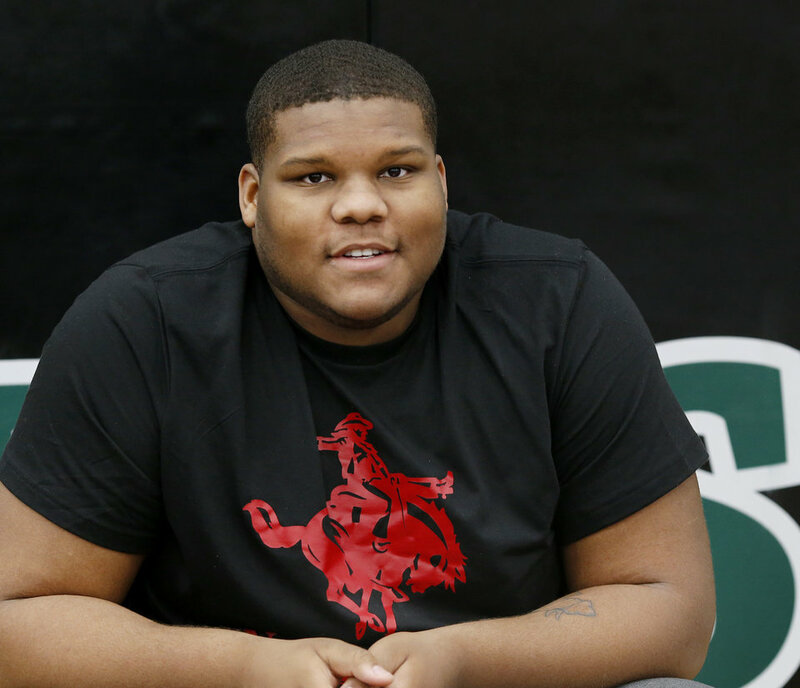 Photo by Jim Beckel, The Oklahoman. 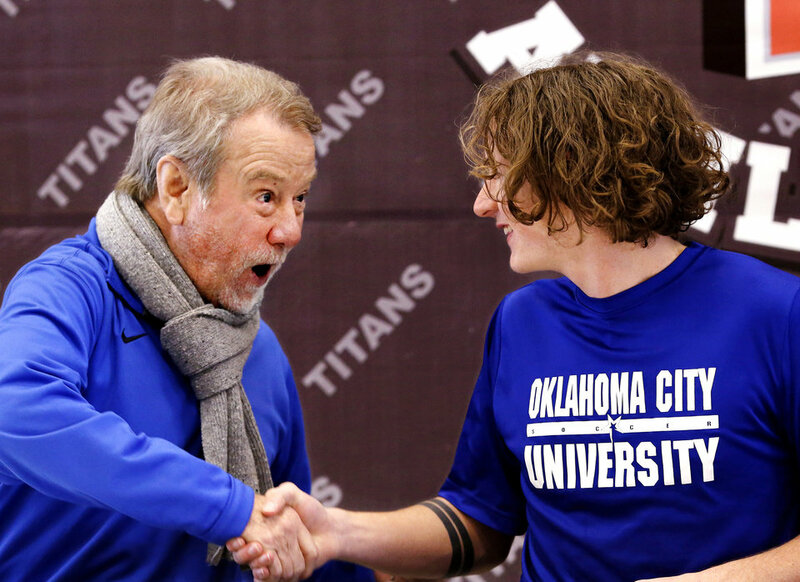 Head soccer coach Brian Harvey enthusiastically congratulates senior Thomas Mcelya after he signed letter to play soccer on Harvey&#39;s team at Oklahoma City University during Signing Day ceremony at Carl Albert High School on Wednesday, Feb. 6, 2019. Photo by Jim Beckel, The Oklahoman. 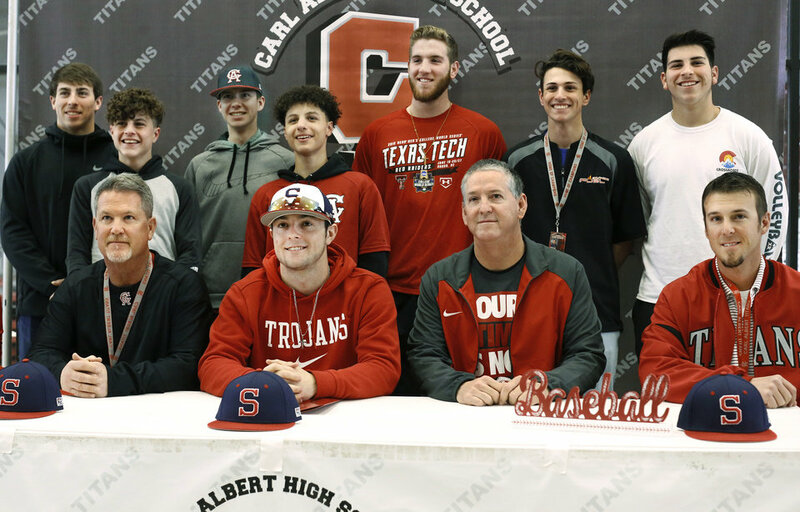 Carter LaValley, seated wearing ball cap, and his dad/coach, Tim LaValley, seated third from left, pose with players on the Titan baseball team after LaValley signed a letter to play at Seminole State College during Signing Day ceremony at Carl Albert High School on Wednesday, Feb. 6, 2019. Photo by Jim Beckel, The Oklahoman. 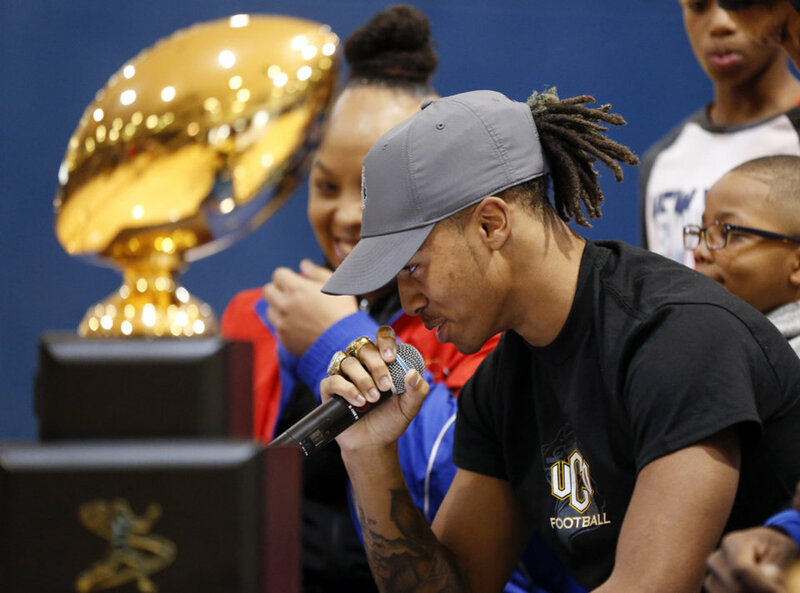 Titans senior Anthony Davis spots a friend in the crowd and gestures after he signed letter to play at UCO during Signing Day ceremony at Carl Albert High School on Wednesday, Feb. 6, 2019. Photo by Jim Beckel, The Oklahoman. 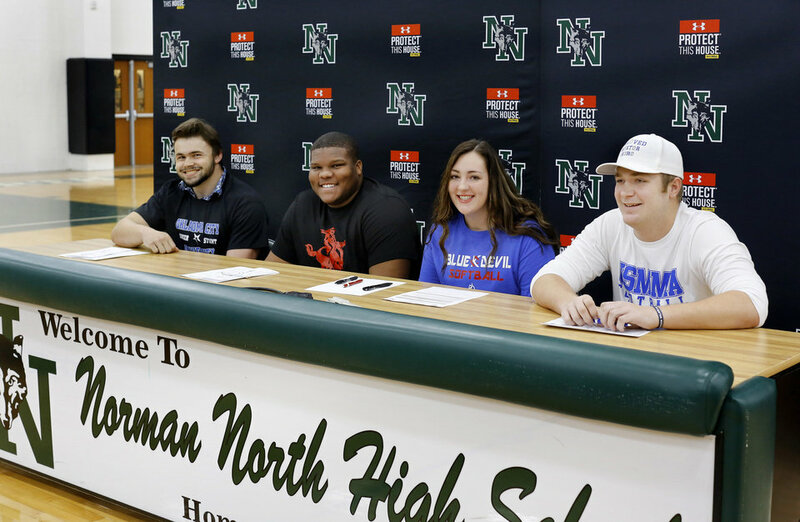 Athletes signing letters during Signing Day event at Norman North High School on Wednesday, Feb. 6, 2019, are, from left, Alex Martin (softball), Blake Yohn (Track/Cheer), Ja&#39;Vion Combs (football) and Bo Kemmet (football). Photo by Jim Beckel, The Oklahoman. 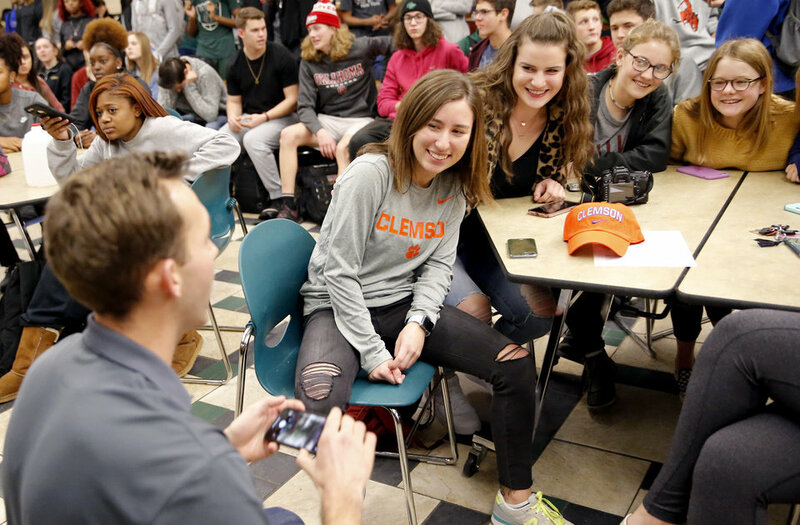 Bo Kemmet receives kisses from his sister, Kate, 20, left, and Meg, 14, at the reception table for the senior football player after he signed to play football with United States Merchant Marines Academy during Signing Day event at Norman North High School on Wednesday, Feb. 6, 2019. Photo by Jim Beckel, The Oklahoman. Next articleCuban Security Lie to US Immigration.